Unfortunately not the best day today. Found 2 of my adult boars dead, lovely Rodders and also lovely Bill. Very sad to lose both of these old boys. Never had any babies from Rodders, which was a shame. I had quite a few from Bill and he went on to be Grandad of quite a few of my show pigs, including Demi, Quaver and Chrome. RIP lovely boys, will miss you!! I had a lovely day at the Worthing & Eastergate show yesterday. Last show of the year and very Christmasy!! 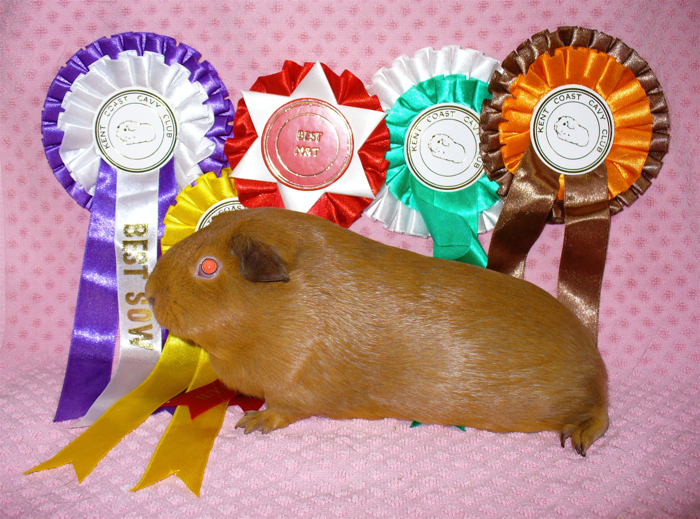 All my pigs did well, but especiallly Sparkle, who did well in the Self Challenges and went on to win Best DE White. A lovely show!! I had a lovely day at the Fareham CC show on Saturday, with Cloud my u/5 Silver Chin sow, coming 3rd in the Best Guide Standard Grand Challenge out of 23!! But a sad day today, found my old show sow Misty dead, such a shame. She looked a bit quiet a couple of weeks ago, but seemed to perk up again. RIP lovely Misty, the last of Mozart's daughters! 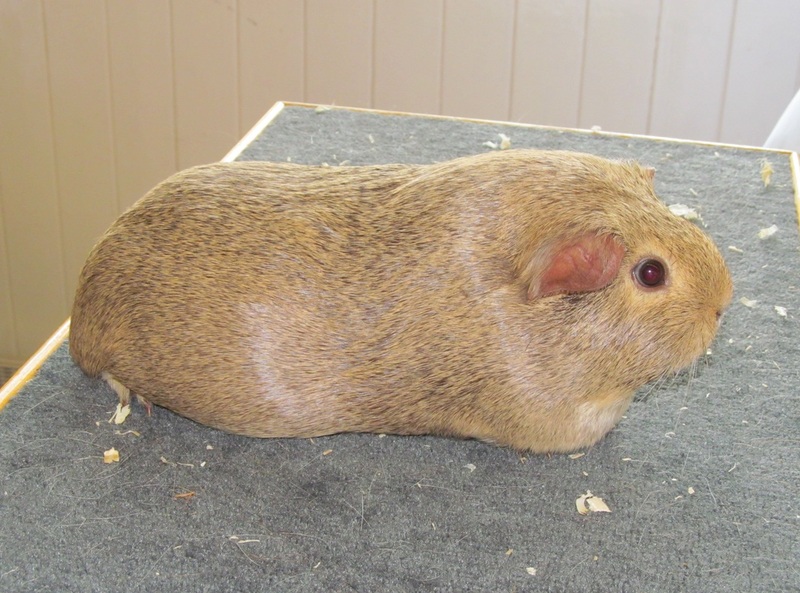 I had a super day at the Canterbury and Coast Cavy Club Show. 2nd in the Guide Standard Challenge with Citron, and my 5/8 DE White sow Sparkle did really well. She was 3rd Best Self and 2nd in the 5/8 Any Variety Grand Challenge!! Well done Sparkle. I moved them all around again. 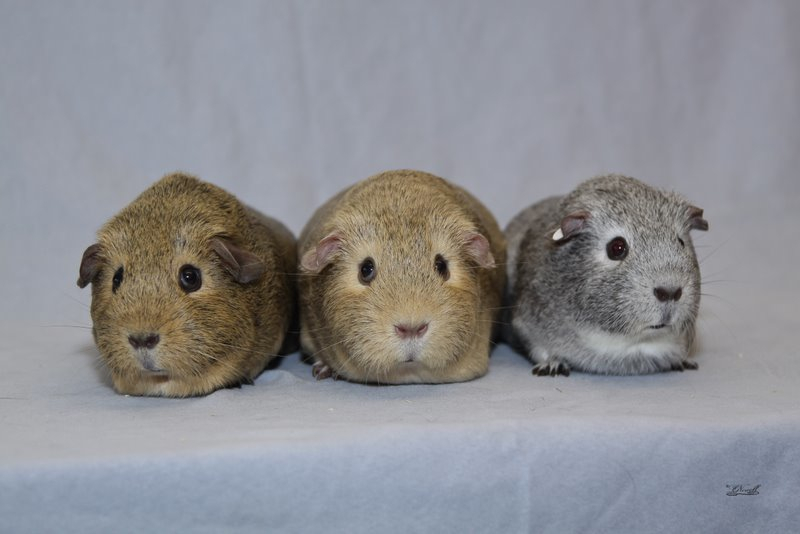 So Morag has the 3 boars left and Ivy has the 2 Silver Chin sows. Seems to be working out well, and even though it was touch and go for the Lemon Chin boar for a while, he seems to be okay, which is great! I think the mild weather helped. Very sad, 3 of Ivy's babies have died, and her milk seems to have dried up!!! Such a shame, so I have put all the babies in with Morag, so she now has 5. She is being a great mum, thank goodness, just hope she copes with all of them. I have left, 2 Silver Chin sows, 1 Lemon Chin boar, 1 DE White boar and 1 DE Cream boar. Born in the afternoon today, around 3pm, a litter of 6!!! 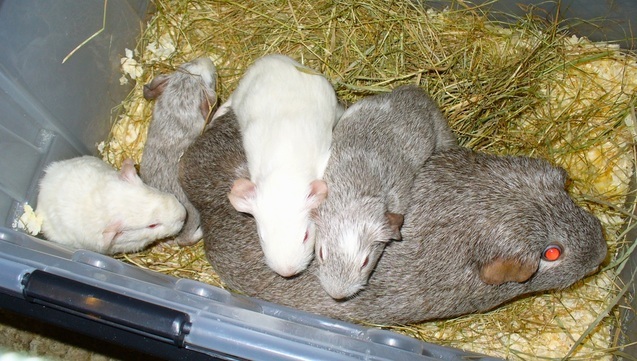 2 DE Whites and 4 Chinchillas, 2 are a good size, but the other 4 are very very tiny! These are my first babies from Chaplin. The 2 largest ones I have given to Morag, so she now has 4, I hope that will work out, so the mum's have 4 each. Clever boy Edmonds, had some lovely babies born from him this morning. 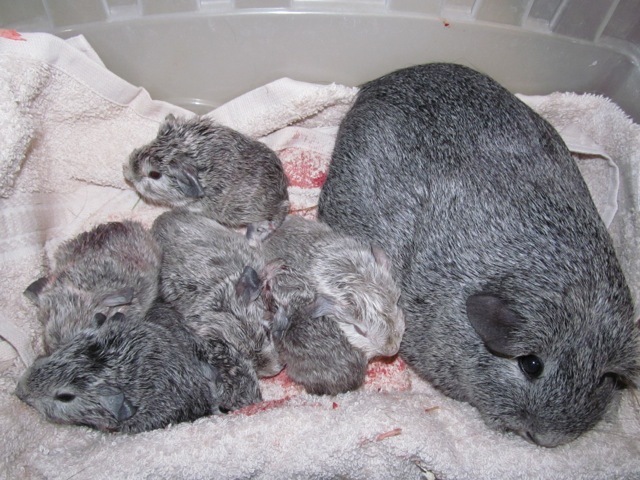 Shame though that there were 2 Chinchillas DOA, so frustrating when you have been waiting for them to be born for so long!! 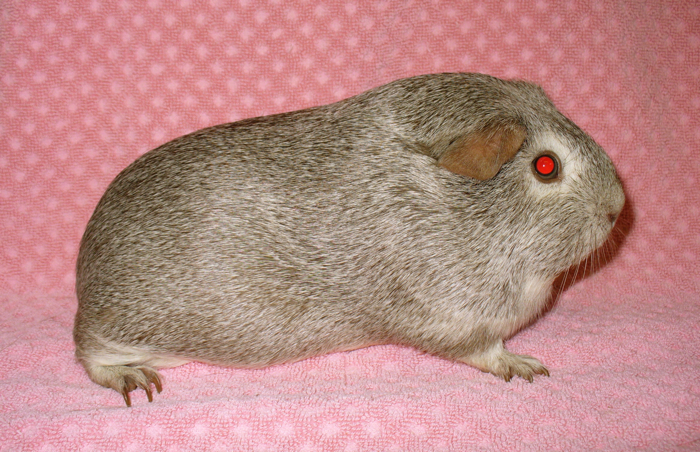 So alive I have 1 Silver Chinchilla sow and 1 DE Self Cream boar. Nice babies though, very forward, running around only after a couple of hours! Morag first time mum is doing well. 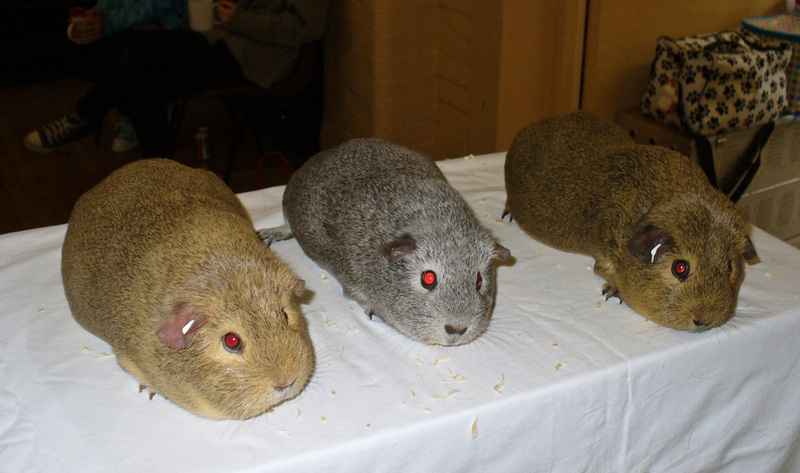 Super show at the North Herts Cavy Association show yesterday. Lovely place to visit and a tasty lunch from Trudi!! Edmonds won Best Guide Standard with Quaver coming 2nd out of 8. Well the ups and downs of guinea pig ownership happened again over the weekend!! 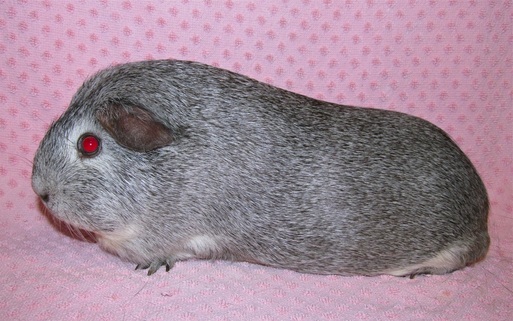 Sad day Saturday, as I lost my Silver Chin sow Penny, RIP lovely girl, Grandmother of many of my show pigs, including Demi, Quaver and Chrome!! :( Sunday was a better day at the Mid Sussex Cavy Club show. Citron won Best Guide Standard out of 14 and Demi came 3rd. Also my DE White sow Sparkle did well again. Citron at the Mid Sussex CC Show. I have had a super day at the Epsom Show, busy day taking photos, but came home with some lovely results. Demi won Best Guide Standard with Quaver coming 3rd out of 17! 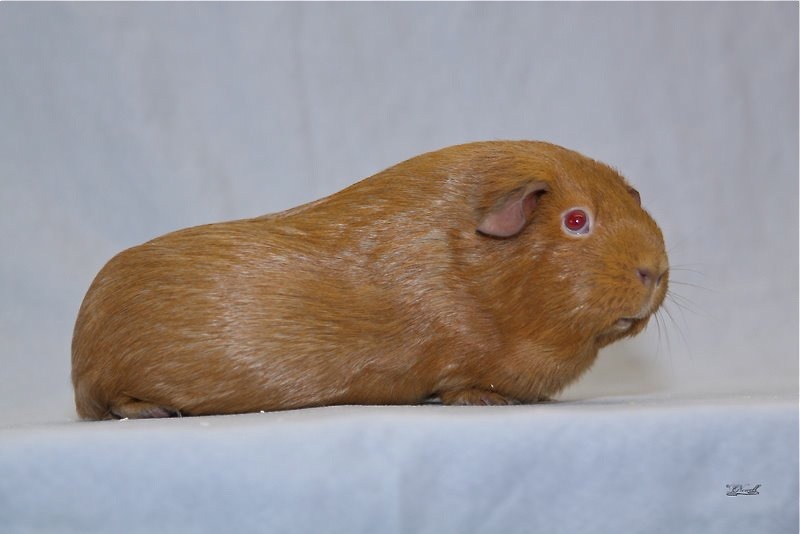 Also my little Cream Chin Dal sow Honey did very well at her first show in the pets, and was in the final line up of 6 for the Best Adult Pet Challenge, but she did not get a place. Sparkle my u/5 DE White sow also did very well at her first show, so a very good day!! :) Here is a pic of Demi. I had a lovely day at the Real London show yesterday. All my Chinchillas got placed, but the best result was from Demi. It was also an RVCC Stock show, she was Best Adult Guide Standard out of 31, 2nd Best Chinchilla out of 18 and also 4th Best Guide Standard overall out of 60!!!! Well done Demi :) Here is a pic of the Best Chinchilla line up with Demi in the middle and Quaver on the left. Well it has been a horrible week, I cannot believe, I have lost 2 pregnant sows and all their babies, both to Toxemia, so horrible, my poor girls, such a great loss to lose these 2 girls, Salt and Maggie. 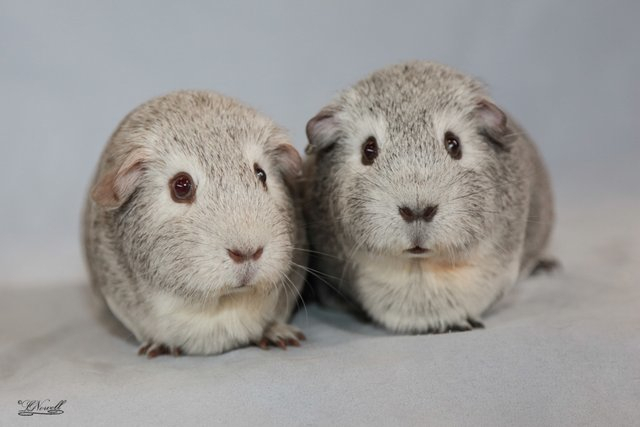 :( At times like this I really feel like giving up breeding my guinea pigs, but I know you have to take the ups and the downs, just seems so unfair!! 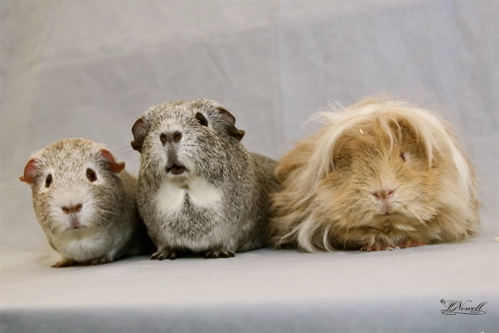 Oh dear today, the ups and downs of keeping guinea pigs. Yesterday I had a super day at the Fareham Cavy Club show, with Citron winning Best Guide Standard out of 25 pigs, lovely day. Yoda also did well at his first show. Lovely surprise this morning, Penny had a couple of babies sows about 10.30 am, just super to catch her having them. 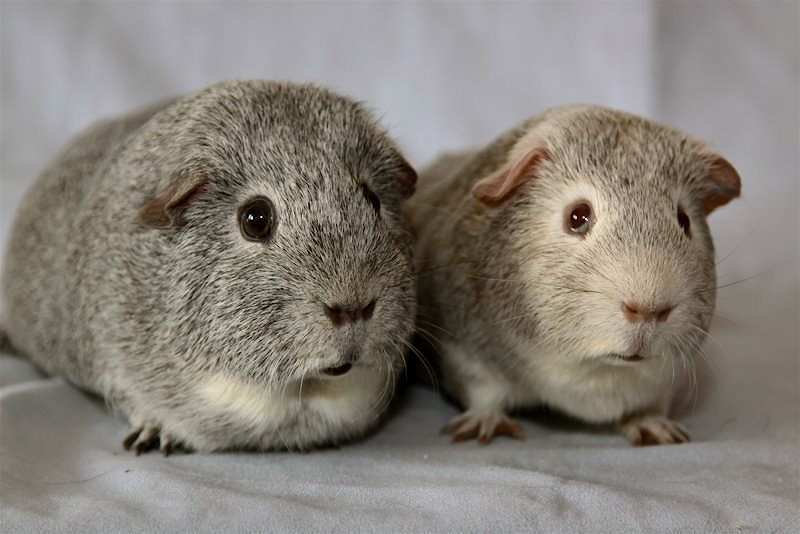 One Silver Chin sow and 1 Lemon Chin Sow, lovely and chunky. 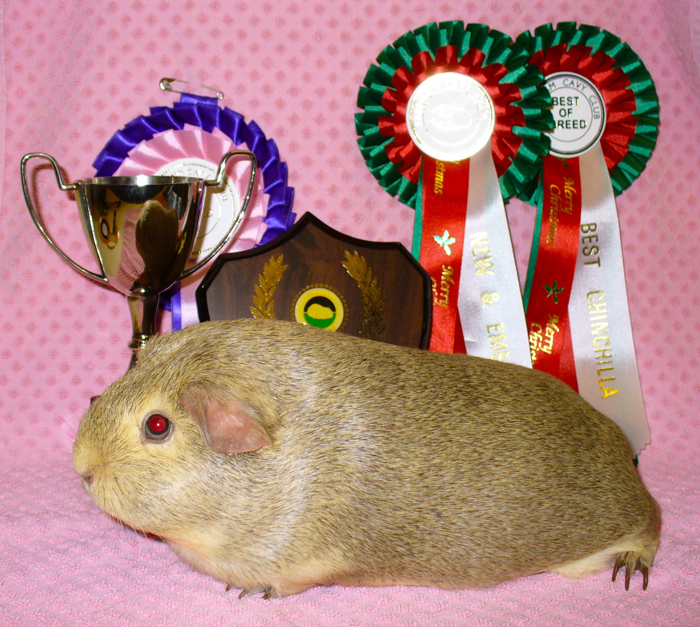 Very sad day today, my lovely dal boar Orlando has died, so very, very sad, I am going to miss him very much, a super kind gentle boar, whom I won Best Pet and Super Pet last year at the Kent Cavy Club show. Will miss you lots Orlando!! Sad day today, my lovely sow Mishka has died, very sad, lovely girl. Will miss her lots, a super mum. Luckily her babies have just got to 4 weeks of age, so hope they will be okay! 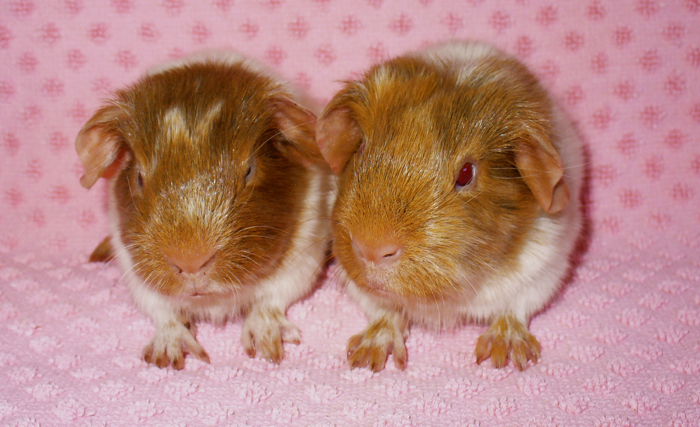 Mum of my lovely Edmonds and Harington, 2 super boars she has given me. RIP lovely Mishka! Carly and Citron enjoying the grass. Born early in the morning, luckily I found Juno having her babies and saved a lemon chin sow, as it was still in its sack, but 1 DOA already born and 1 DE cream sow alive. Unfortunately then her contractions stopped, so I took her off to the vet, who did a super job with some extra oxytocin and managed to deliver the 2 that were very big and had been stuck, but both were dead. :( So just 2 alive, but thank goodness Juno is all okay! An eventful morning!! Another surprise this morning, found Mishka with her new babies, just born, still wet. A litter of 7!!! One DOA, but 6 alive, 4 look quite big, but 2 are very tiny!!! :( I hate it when they have big litters, makes the babies so small! Four are chins and 2 are self creams. Super day today at the Dorking Cavy Club Show. Citron won Best Guide Standard and Edmonds came 3rd out of 21, a lovely result. Also Harington had a good day at his first show, 2nd best u/5 Guide Standard and was in the final Guide Standard line up, so I think he would have come 4th. Well done Harington!! Lovely surprise turned up in the post today. 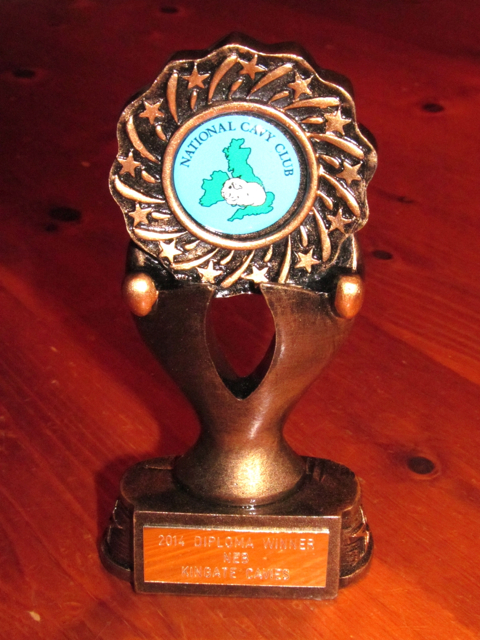 I won a trophy from the National Cavy Club for collecting the most New & Emerging Breed Diplomas for last year 2014! Another brilliant show yesterday at the Fareham Cavy Club show. 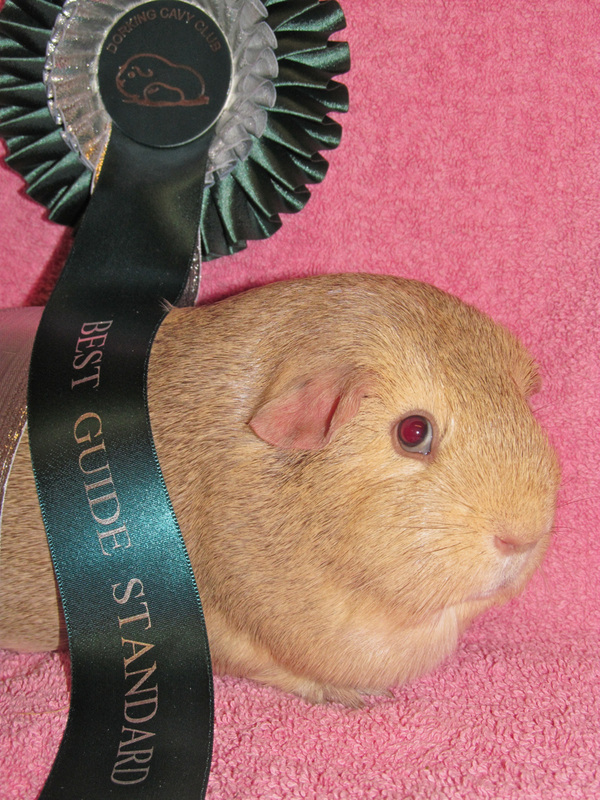 First and 3rd Best Guide Standard with my lovely boars Benedict and Edmonds. This was Benedict's first show, what a great result!!! A big entry with a class of 32!! Very happy! :) Benedict is very special, son of my lovely Daisy that I lost earlier in the year and also grandson of lovely Munchie! Here is Lyndon Nowell's photo from the show. I had a super day at the Mid Sussex Cavy Club Show yesterday. Also hosting the SCC Spring Stock Show, so a double show on the same day. All my Chinchillas did very well, Demi winning Best Guide Standard on one side and Citron winning Best Guide Standard on the other side. Lovely surprise also, Edmonds getting 2nd Best Guide Standard to Demi out of 15 on the Mid Sussex side, at only his 2nd show, he is a lovely boar!! :) Here are some of Lyndon's photos from the show. I had a lovely day at the Worthing and Eastergate Cavy Club Show yesterday. Demi won Best Guide Standard out of 15, super result!! Also I took a couple of pigs to their first show. Flo did well in the u/5 Guide Standard Challenge and also Edmonds got his first cards. Here is Lyndon Nowell's lovely picture of Demi from the show. Brilliant news, I had a super day at the Dorking Cavy Club show yesterday, my lovely Cream Chin sow Citron won Best Guide Standard with Demi coming 2nd and Quaver 3rd out of 13. Absolutely thrilled, the first time I have won Best Guide Standard with a Chinchilla, here is a pic of the 3 of them!! :) This result has a special meaning for me, after losing Citron's mum last year, my lovely Morgana very suddenly, I am thrilled that her daughter has won this special prize for me! ﻿﻿Here is a pic of Citron with her lovely rosette. Super start to the new year! 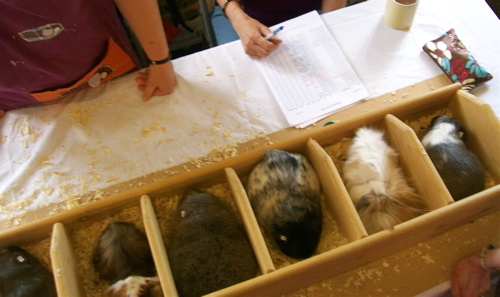 Showing the Chinchillas in the Guide Standard Section for the first time, at the Epsom Cavy Club Show today. 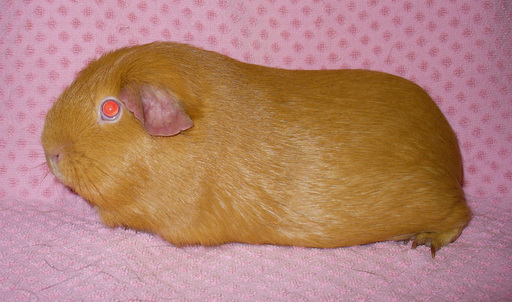 My cinnamon sow Demi came 2nd in the Guide Standard Challenge out of 15, really pleased with that!! Also my Cream u/5 boar Chaplin did very well at this first show, very pleased, his lovely mum Morgana would be so proud!! Oh dear not a good week, total shock, found lovely little Melissa dead in her hutch today, nothing wrong with her, so very very sad, cannot believe it!!! RIP lovely Melissa :( I hope it was nothing to do with my bad cold!! I have had a super day at the Fareham Cavy Club Show, Hosting the SCC Adult Stock Show. Lovely Big Ben won Best New & Emerging on both sides out of 11, well done Ben, super piggie. Also Melissa came 3rd in the Best New & Emerging Challenge on the Fareham side, and on the SCC side Demi came 2nd and Citron came 3rd in the Best New & Emerging Challenge, also out of 11. And Orlando had a super day, 2nd Best Adult Exh Pet and 3rd in the Super Pet Challenge out of 80!! A great day, thank you Fareham Cavy Club Show team! And I won the Photo Competition and got Lyndon to take a super line-up photo of my chins!! :) Last show of the year, it has been great one for the chinchillas. Here are some of Lyndon's Photos of Ben and Melissa, and also of Orlando in the pet line-up (he is in the middle). Went out late last night to turn off the radio (due to firework noise) and found Morgana had had 2 lovely chunky cream baby boars, lovely babies from Cheggers. They do produce some lovely babies as a pair!! :) Here is a pic of Morgana's boars. I had a good day today at the Mid Sussex Cavy Club show. Ben won Best New & Emerging and Demi my u/5 sow came 2nd. Also Citron came 4th. All my pets won their breed classes. There were 8 chinchillas being shown today! I had a super day at the Kent Cavy Club Show yesterday, really enjoy this show. Demi my u/5 chin sow won Best New & Emerging out of 11 with Hazel coming 3rd. Also all my pets, Orlando, Chrome and Salt won their breed classes, so a good day. I have had a lovely day at the Real London, all my chins have done well, and Ben got Best Adult New & Emerging out of 10. But a surprise last night while getting ready for today, I found that Mishka had had her babies at around 9pm. A litter of 5, but unfortunately 1 DOA :( Some promising chin boars though! Nice surprise this morning, to find Daisy had had her babies, 1 lemon chin boar, 1 cream chin boar, 1 self cream sow, 1 white DOA :( The 3 alive are lovely, all doing well, following Daisy around. She is a very experienced mum! I had a lovely day at the Worthing and Eastergate Cavy Club show. I took quite a few first time out at show pigs. 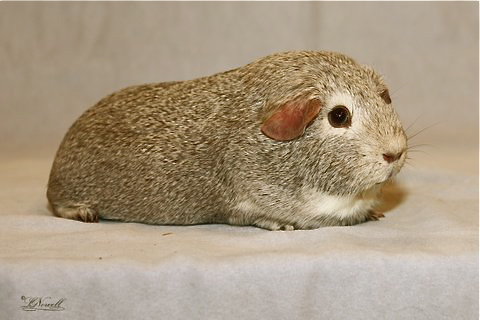 My pets sows Salt and Pepper did not get placed, but my little u/5 cinnamon chin boar Craven came 3rd in the New & Emerging Challenge, great for his first show. I had a super day at the Epsom Cavy Club show today. Hazel won Best New & Emerging and little Demi came 3rd. Also did well in the pets. Little Juno won 3rd Best Pet out of 74 and also came 2nd in the Supporters Class, so a lovely day! Here are some pics from Lyndon Nowell of the New & Emerging line up and also the Adult Pet line up, Juno is on the right. And one of Hazel having a snooze in her pen!! I had a lovely time at the Dorking Cavy Club Show today. 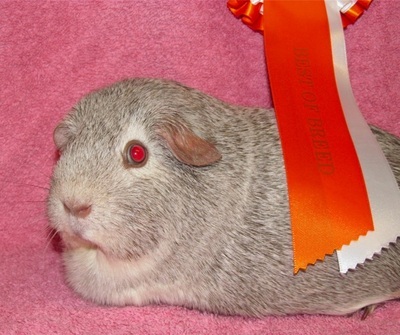 My u/5 cinnamon chin sow Demi won Best New & Emerging out of 12 with my silver sow Hazel come 2nd. Very surpised, this was Demi's first show!!! A super show, thank you to the Dorking show team. Here is a pic of Demi and Hazel, thank you for the photo Lisa Kavaney. Sunflower surprised me this morning, litter of chins born. Unfortunately 1 DOA, but 4 alive. One though is so tiny!!!! :( All boars! 2 lemons, 1 cinnamon and 1 silver. Fun, my email has been hacked, so I have a new address, you can contact me on kingatecavies@yahoo.co.uk or call me at home. I had a super day at the Fareham show on Saturday. Ben won Best New & Emerging with Hazel coming 2nd, and little Juno won best u/5 pet and came 5th in the overall Pet Challenge out of 100 piggies, so a super show for her first time showing, well done little Juno!! :) Here are some pics from Lyndon Nowell. Here is the Best New & Emerging line up, Ben in the middle and Hazel on the left. I had a lovely day at the Mid Sussex Cavy Club show. Ben did very well and won Best New & Emerging out of 12 and also my pet chin dal boar Chrome did very well at his 2nd show, he came 3rd in the Adult Exh Pet u/5 challenge out of 25!! Well done Chrome. I had a super day at the Canterbury & Coast Cavy Club Show, with the SCC Stock Show. Ben came 1st and Paris came 2nd on the Canterbury side for Best New & Emerging, and on the SCC side Paris came 1st and Ben came 2nd in the New & Emerging Challenge. Orlando did quite well in pets and so did Chrome at his first show! Cashew finally had her babies from Chewie, thank goodness I was there! A litter of 6 babies!!!! She definitely needed help. Two of the babies were huge. A couple are a bit small, but not that small! Just keeping an eye on them as she is a little bit shocked I think and a first time mum. Ben is now a grandad!! No wonder the babies were big! I have had a lovely weekend. 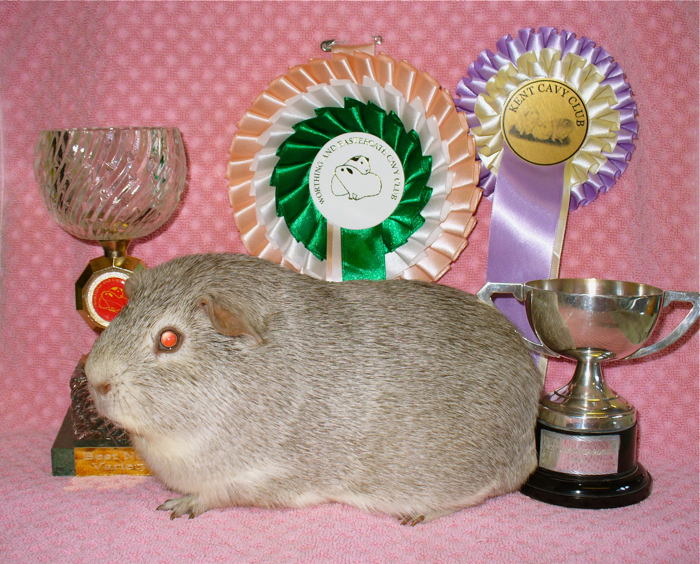 Ben won Best New & Emerging at the Worthing & Eastergate Cavy Club Show at Parham, with Paris coming 2nd and Hazel 3rd. Super result, pic below from Lyndon. Also Morgana had a litter of 5 lovely chin babies in the morning, so pleased as it is her first litter and she is over a year old!! 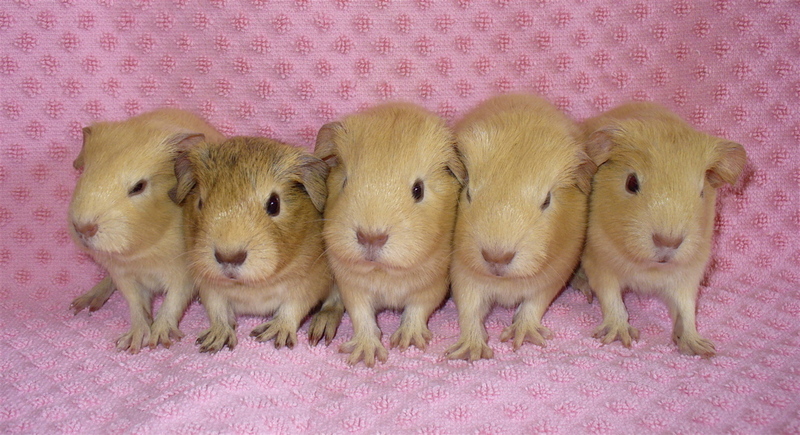 Four lovely cinnamon chins and 1 cream chin. She is being a super mum, which is just what I expected really, she is such a laid back girl! First babies from my cream chin boar Cheggers! 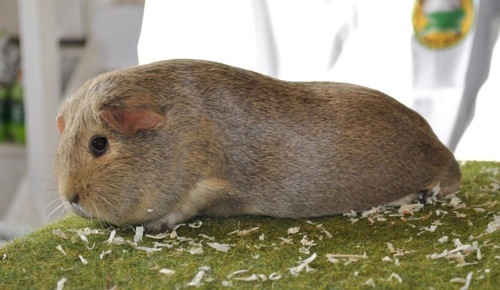 I had a super day at the Kent Cavy Club Show. Ben was Best New & Emerging and Moneypenny was 3rd out of 15, a lovely show as usual, super day! 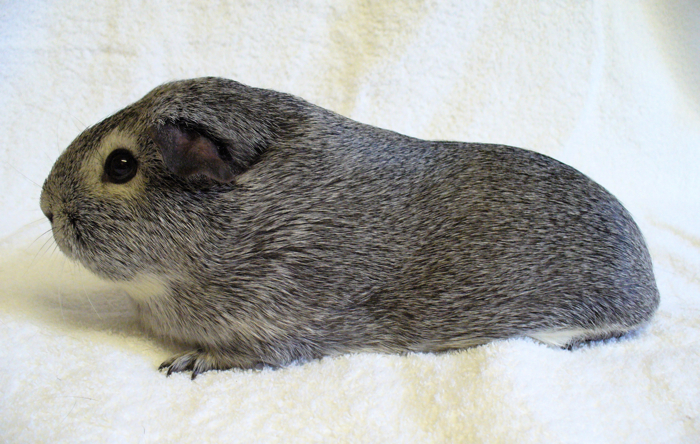 Lovely surprise this morning, Penny has had a single silver chinchilla sow, lovely big baby. I had a feeling Penny may have been only going to have one baby, as she was not very large. Sad to read on Facebook though that poor Jacqui was being accused of cheating over giving my boar Orlando best pet, such a shame, sour grapes maybe!!!!! If people want to act like this, then no one will want to judge pets any more, and clubs are finding it hard enough to get pet judges. Feel sorry for Jac and makes my lovely winning seem sad now!! I have had a super day today. First of all Daisy produced her babies at about 8am this morning, just as I was leaving to go to the Kent show. 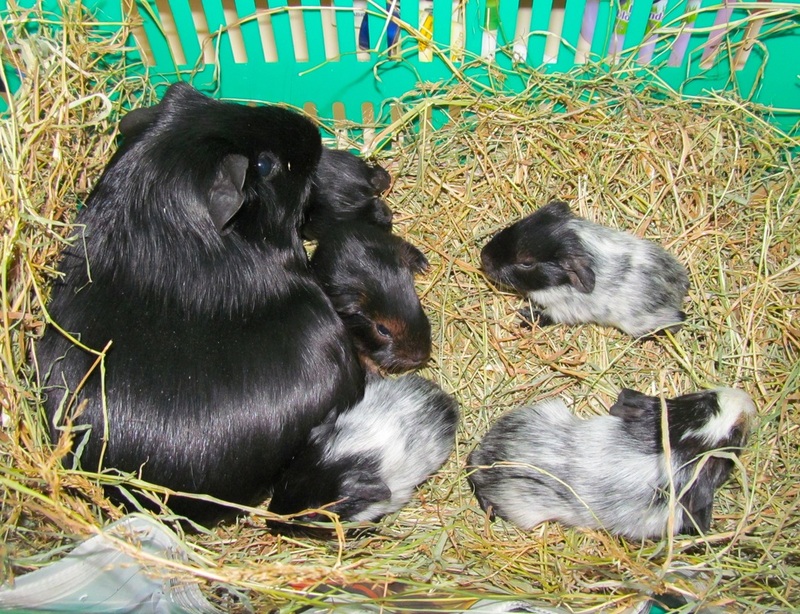 She has had 4 lovely babies, 2 golden agoutis and 2 dal agoutis. She is a good mum, and when I got home they were all lovely and clean and dry. 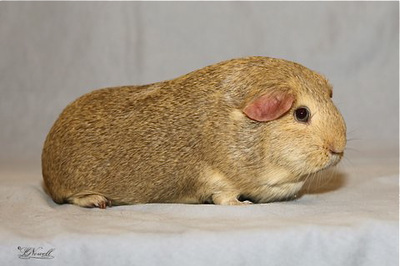 I had a super day at the Kent Cavy Club show, Orlando won Best Adult Exhibitors Pet out of 70 and then went on to win Best Super Pet, so Best Pet in Show!!! Brilliant, well done Orlando. He is also dad of the babies born! :) And I also had 1st & 2nd Best New & Emerging with Ben and Paris. A fantastic day!! I had a super day at the Fareham show today. 1st, 2nd and 3rd Best New & Emerging with my chinchillas, Sunflower, Paris and Ben. Here are a couple of pics from Lyndon Nowell. Here is a pic of Ruby before she had the babies!! Well the 3 chins did it again today. At the RVCC show, Ben came 1st, Paris 2nd and Sunflower 3rd, in the Best New & Emerging Challenge, so the other way around from last week!! On the Mid-Sussex Club Show, Paris came 1st and Ben came 3rd. So a brilliant day, very proud of my chinchilla showing team!!! Thanks for the photos Lyndon. I had a super day at the Worthing & Eastergate Cavy Club show, and SCC Spring Stock Show. On the Worthing side I had 1st, 2nd and 3rd Best New & Emerging, with Sunflower, Paris and Ben. On the SCC side I had 1st and 2nd Best New & Emerging with Paris and Ben. Also my friend Daniel came 3rd with a chinchilla boar that I had bred and sold to him, so a good day for Kingate Cavies and the chinchillas!!! Here is a pic of Sunflower, Paris and Ben. Thanks for the photo Lyndon. Paris is famous!! 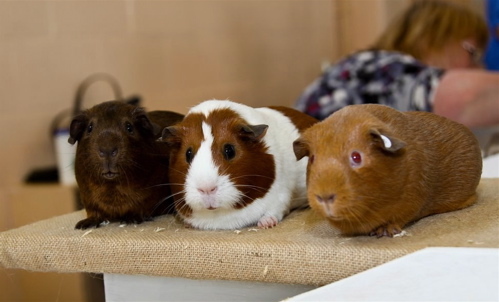 Here is an article from the Surrey Mirror about the Epsom Cavy Club show on Sunday. A reporter came and had a chat with me and took a few pics, lovely to see an interest in the guinea pigs and the shows!! I had another super weekend showing. 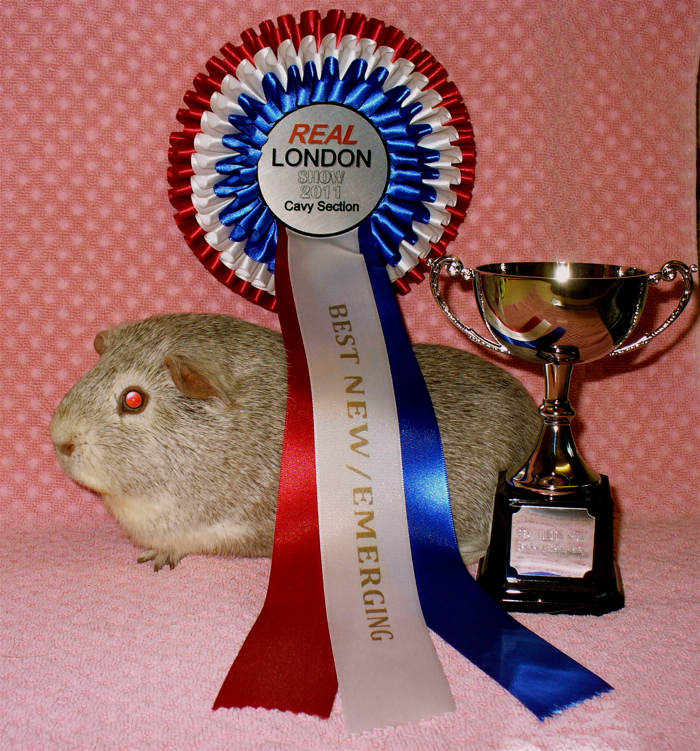 This time at the Epsom Cavy Club show, and Paris again won Best New & Emerging Variety out of 13, super little piggie!! :) And a huge rosette! Here are a couple of photos from Lyndon Nowell. The Best New & Emerging line up. My first litter of the year just been born today from Caress and Orlando. And 3 dals, what a surprise! Cute babies, but of course, the biggest one, a lovely boar is not right, poor little chap. It is such a shame that sows have their babies in the night when you are not watching, so frustrating. I have been watching Caress for 3 days now. I think she was fed up with me keeping on opening her hutch door to check her!!! Happy new year to everyone. Afraid though I have had to put my prices up for boarding this year. I have had to do this with the increase in the price of bedding and food an also other things like disinfectant and shampoos. Hope to see some of you boarding with me this year. 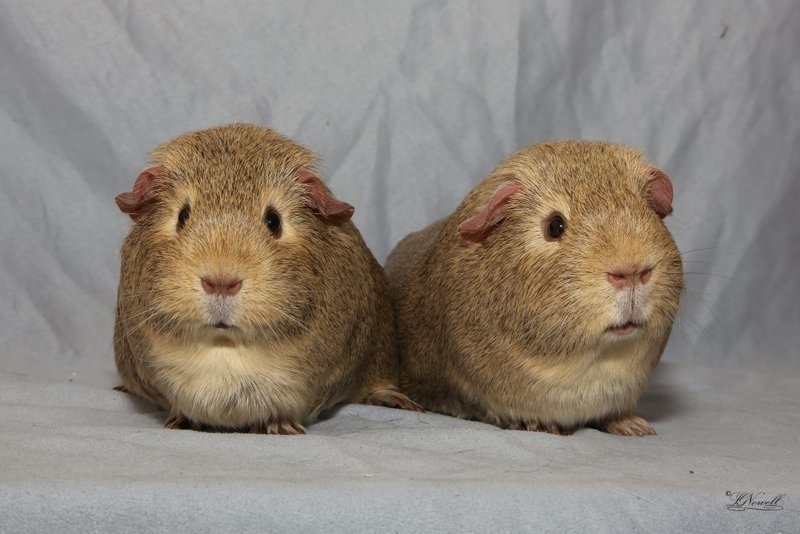 Also I cannot board 4 guinea pigs that live together any more, but they can be split into pairs if that can work. I had to get rid of my large indoor cage that I used to use. I still have a large hutch that is fine for 3 pigs boarding together, but 4 might be a push!!! Bit of a surprise this afternoon, Morina has had her babies, while I was out cleaning out some hutches. 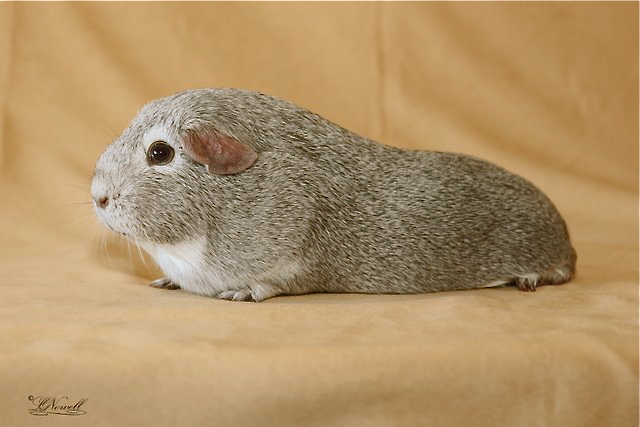 She has had all silver chinchillas, I think there are 2 boars and 2 sows. 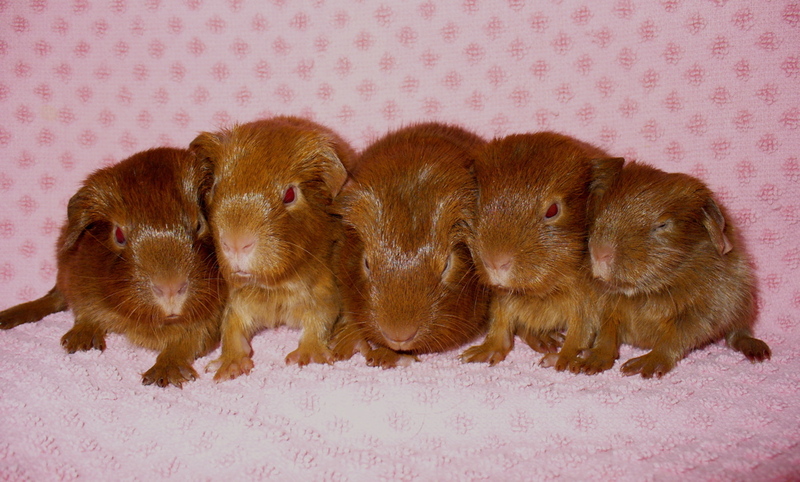 All very cute :) Smokey Joe is the dad, my first litter from him. I had a lovely day at the Fareham show today. Morgana was 2nd in the New & Emerging Challenge and Paris came 3rd. 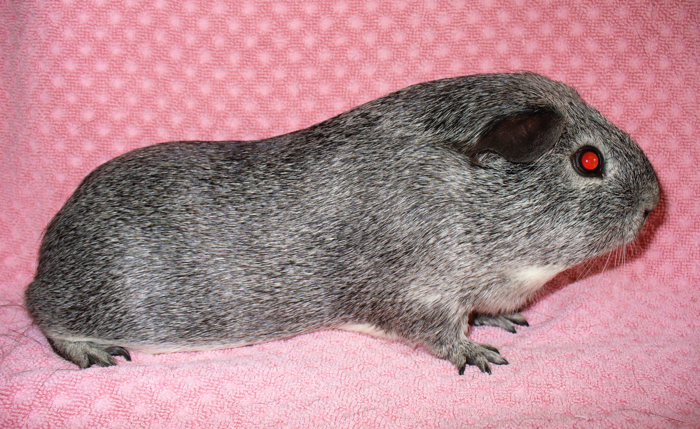 Morgana also won best Chinchilla. Orlando did well in the pets and won 2nd best 5/8 pet and was in the final line up for Best Adult Exh Pet Challenge. Here is the photo of the line up from Lyndon Nowell. 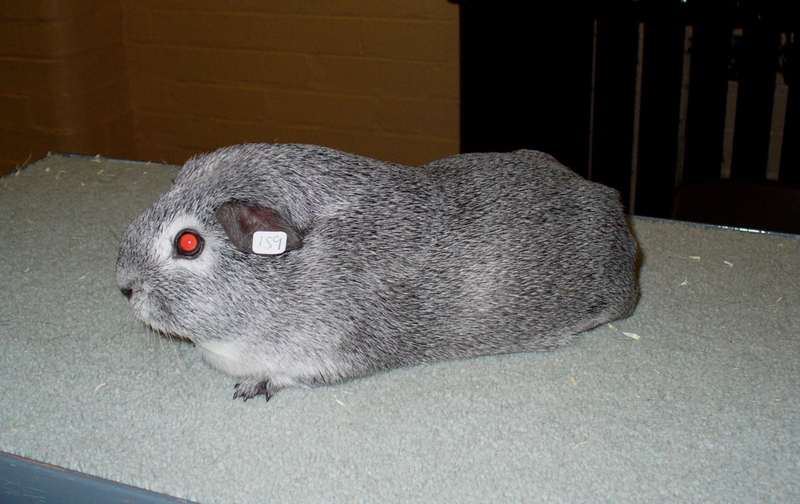 I had a super day at the Dorking Cavy Club show. All my chinchillas did very well. Here is the final line up of Best New & Emerging. Carly is 1st and Paris is 2nd. I also took Maisie out to a show again, she went in the SCC Pet Show. 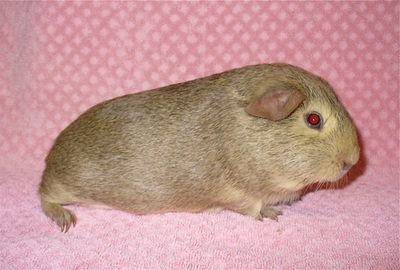 What a super piggie, 2nd Best Adult Exhibitors Pet out of 65 and also 2nd Best Superpet!!!! :) A lovely day. Photos from Lyndon Nowell. I had a lovely day at the North Herts show, best new & emerging with Carly out of 12 and then when I got home I found Daisy had just had her babies. A lovely chunky litter of 5. Two chins, 1 pe white and 2 creams. All look large!! :) Lovely news after a horrible week!! Well what a brilliant day I had yesterday at the Real London show. 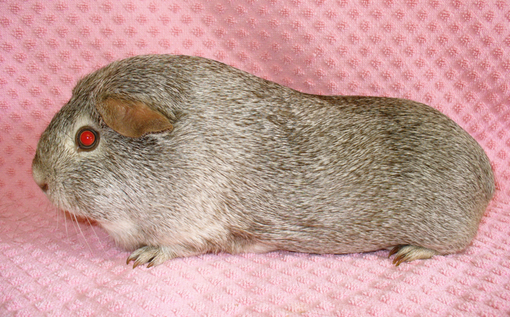 My lovely u/5 cream chinchilla sow Paris won Best New & Emerging out of 25!!!! :) Could not believe it, only her second show!!! Also Carly won the Best Adult New & Emerging and Morgana won the Best 5/8 New & Emerging, and also both came home with a super rosette each. A lovely show, but a long, long day!!! Here is Lyndon's photo of the line up. Also Carly won the Supporters Class, so came home with a £10 prize as well! Here is judge Steve French with Carly. I had a lovely day at the Essex Cavy Society Show today. Also hosting the SCC Intermediate Summer Stock Show. My chins did me proud!! Paris at her first show, beat her aunties Carly, Mishka and Morgana and won Best New & Emerging on the SCC side!!!! Well done Paris, Mishka came 2nd and Carly came 3rd. Though interesting, nothing on the Essex Cavy Society side today!!!?? Thanks for the photo Lyndon. I had a great day at the Fareham Cavy Club show, Morgana won Best New & Emerging and her sister Mishka came 2nd, well done girls. Also Orlando did well in the pets, so a lovely day. Photo from Lyndon Nowell. Busy day today, woke up early to find that Poppy had given birth to just 2 babies this time, 1 cream chinchilla boar and 1 pe white sow. Lovely big babies, but a real surprise she did not have more!!! Also a lovely day at the Canterbury and Coast Cavy Club Show, no big prizes today, but all the chins did well in the classes and Orlando did well in the pets. A lovely day. Lovely day at the Mid Sussex show on Sunday. Carly Won Best New & Emerging and Morgana came 3rd. Well done girls! Super day at the North Herts Cavy Club show today. Best New & Emerging with my u/5 sow Morgana and also super Orlando won 3rd best adult exhibitors pet!!! Great day and a lovely show. Lovely to find a super chunky litter of 5 babies all safe under Penny this morning!!! I think there are 4 lemon chins and one pale silver chin, I will have a good look later in the day. Well done Penny! What a lovely day at the Worthing & Eastergate Cavy Club show at Parham Park I have had. 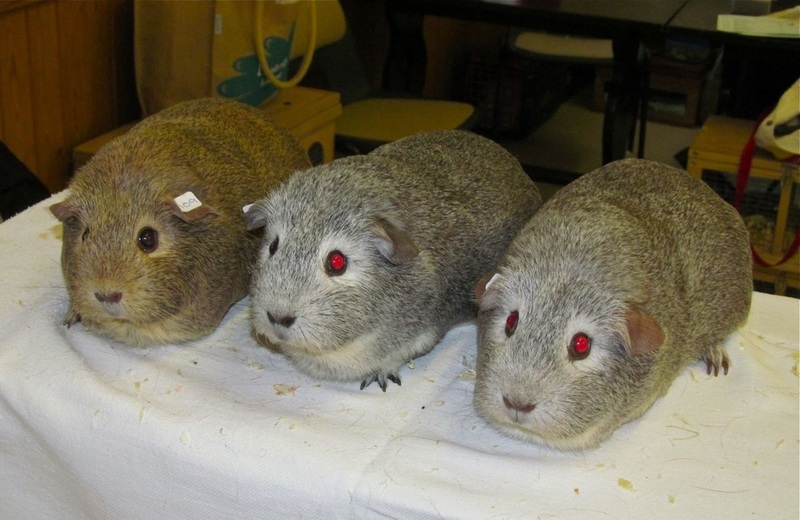 Also the Southern Cavy Club Stock Show. Carly won Best New & Emerging on both sides and little Mishka came 2nd to Carly on the Worthing side, with Morgana coming 3rd. A long day and unfortunately again very windy, just like last year. Makes it very noisy in the tent!! Lovely surprise this morning, I found a very pretty baby black dalmation sow in with Cruella, just a single baby, but very cute. Interesting no black and tans?? I had a super day at the Kent Cavy Club show and Southern Cavy Club Spring Stock Show yesterday. Carly won Best New & Emerging on the Southern side, and Toffee my argente boar won Best Argente on both sides and did very well in the u/5 months challenges. A good show. Lovely surprise to find this morning, Daisy had her a babies, a lovely litter of 4. Two chins and 2 self creams. Very lovely babies. I think on of the chins is buff coloured, so a bit different! 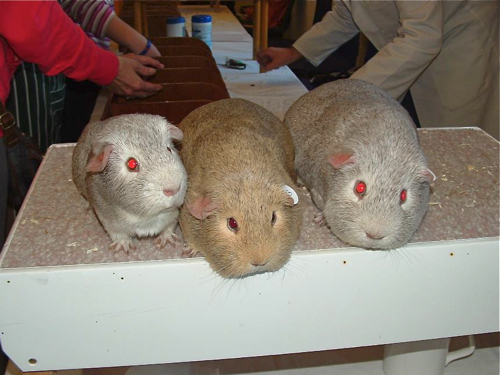 I had another super day yesterday at the Dorking Cavy Club Show. Carly won Best New & Emerging out of 14 and little Sable her niece came 3rd. Great show. Here is a pic of Carly in her pen, and also Carly with the chin from Veejay Cavies who came 2nd. I had a super day at the Canterbury and Coast show today, Ben won Best New & Emerging out of 12, lovely result and great to have a good chat with the chinchilla breeders!! I had a lovely day at the Fareham show today. Ben did well and came 3rd in the New & Emerging Challenge out of 9. Good to get back to the shows again after all the snow!!! Here is a pic of the line up taken by Lyndon. Here is Lee New's video from the Fareham show. Mandy had her babies from Ollie last night, she had 6!! Unfortunately 1 DOA, but 5 alive. There are 3 dals and 2 black & tans. One of the dals if very tiny. I did not want to bring her inside last night, as blacks don't like to be moved around and are very fussy, but the babies seemed fine, even though it was so cold!! 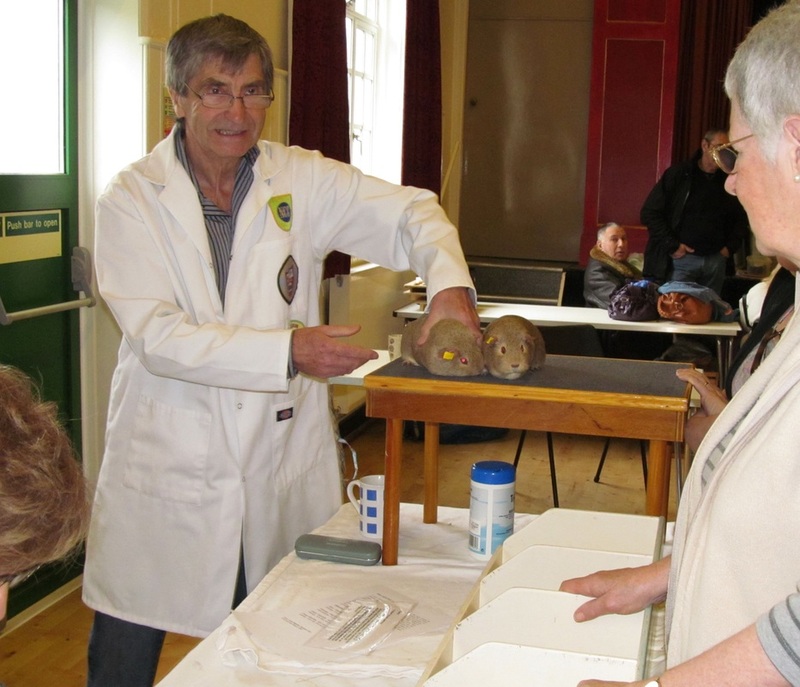 I had a super day at the Mid-Sussex Cavy Club show yesterday. Ben won Best New & Emerging out of 11 and Carly came 2nd. Lovely result :) Here is a pic of Ben and Carly being judged by Bernard Wiles. Not such good news today, Daisy had one huge DOA baby boar this evening. Such a shame, I had not realised she was due, as she only had one baby, she did not look that pregnant. Very sad, it was a lovely cream chin boar. It weighed 200g, HUGE!!! Just had a lovely surprise, Sesame has just had her babies this morning from Miracle, a litter of 4. Three sows and 1 boar, all chins, look lovely and chunky. I will check later, but Sesame seems to be a really good mum, really cleaning them up and being very protective. So pleased as this is her first litter. Seems she takes after her mum Poppy! Great to be back at the shows, I had a lovely day at the Worthing and Eastergate Cavy Club show. Carly came 2nd in the New & Emerging Challenge out of 12, great result from Carly. Here is a pic of the line up taken by Lyndon. Sam, who is sister of Misty is on the right. Here is also a pic of Carly and Ben that Lyndon took for me. Sparkle has had her babies from Fudge this evening about 9.30 pm. A litter of 5 in total, but unfortunately 3 DOA, I must have just missed her having them, so frustrating as I had been watching her all day!!!! The 2 alive are - 1 lemon/lilac argente boar and 1 golden/lilac argente dal sow. They were a bit cold, I warmed them up with my hairdryer and put inside in a box with Sparkle. Great news in Cavies Magazine today, the chinchillas have a revised description and new colour names!!! Been waiting for this for ages and now it is official. 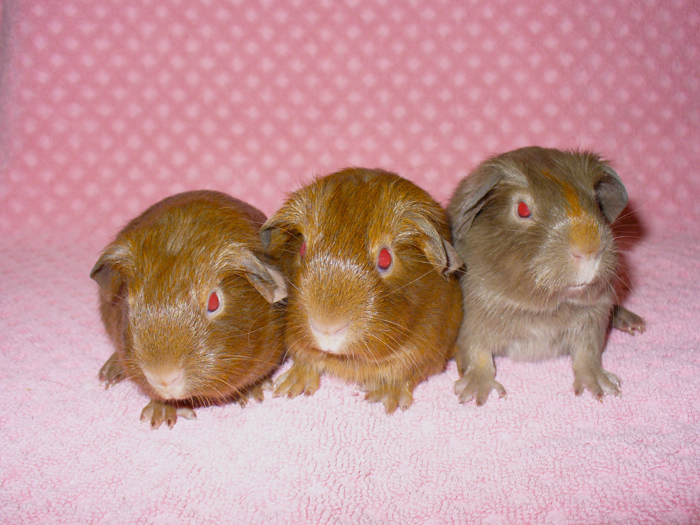 They will now be Cinnamon, Silver, Cream and Lemon from January 2013, so much easier to describe them. I will put the new details on my "About Chinchillas" page later. Very pleased about this!!! I had a lovely day at the Fareham show in the new hall. Carly won the Best New & Emerging Challenge out of 18, super result, she really is a lovely sow. Following in the footsteps of her Auntie Sherbert who won the same prize and trophy last year!! Here is a pic of Carly taken at the show by Lyndon. After a lovely day yesterday, some sad news today, I have lost my lovely saffron sow Saffy today. She did seem quiet yesterday when I got home and I found her dead later today in her hutch, no real reason, such a shame. Will miss you Saffy, thanks for all your lovely babies! I have had a lovely day at the Dorking Cavy Club show today, Carly had her best result, she won Best New & Emerging out of 7 and beat her brother Ben this time. Well done Carly! Bit of a sad day today, found my oldest guinea pig Wonder dead this morning. 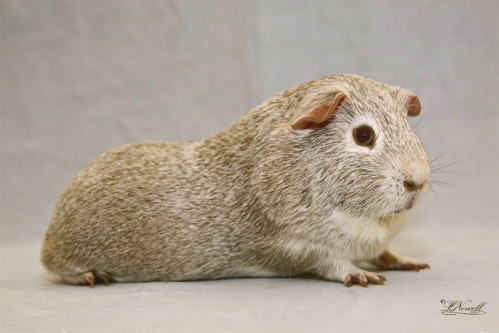 Great shame, but she was getting on for nearly 6, I think one of my oldest guinea pigs. Lovely sow who also did well at the shows. RIP lovely Wonder. I had a super day at the Mid Sussex Cavy Club show, Ben won the Best New & Emerging Challenge with Carly coming 3rd out of 19 pigs. Well done both Ben and his sister Carly!! Here is a pic of the New & Emerging line up, Ben is on the right, Carly on the left. Poppy has had her babies this morning. A litter of 4. Two are chins, 1 boar and 1 sow, and also 2 pe whites, one of which is a teddy!!! One of the chins is very tiny, will check on them later. Poppy is being a good mum. I had a brilliant day at Canterbury and Coast show yesterday, Ollie had his best ever result, he was best u/5 Adult Pet, and then was 2nd Best Pet Adult Exhibitors Pet in show out of 62! He also went on to be 3rd Best Super Pet out of 90!!! Really amazing, well done little Ollie!!! I had a lovely day at the North Herts show on Saturday. I took my young chin brothers Bill and Ben out for the first time, very pleased with their results. Ben came out on top, 3rd Best New & Emerging out of 10. They are such big boys though, even though they are just over 3 months!!! I will have to take their sister Carly out to show as well very soon. Ollie did well also in pets. Lovely show as always, I really enjoy going to Sandon! I had a super day at the Epsom Cavy Club show yesterday, a very busy show sorting out all the trophies, but everything seemed to go well. 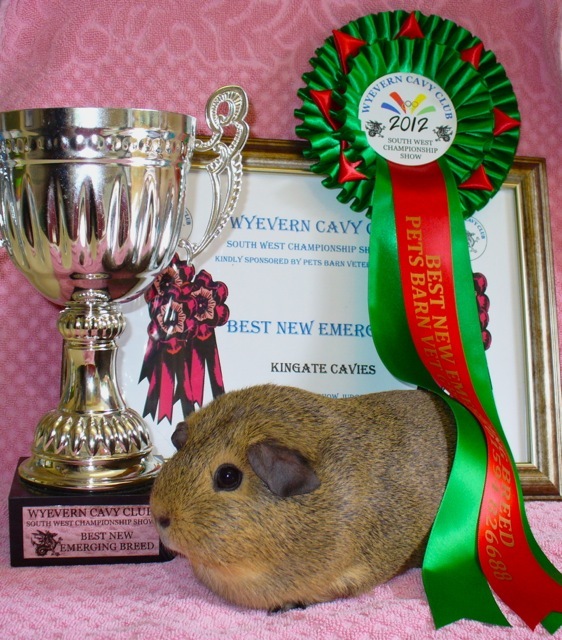 Daisy won Best New & Emerging, here is a pic of her from Lyndon, with the chins from Veejay Cavies. Sam on the right is son of Mozart and brother to Misty! Well I think my bad luck is still continuing, come home from hols to find Merlin not well, he is not eating, I have had his teeth checked twice and sorted out. He does have an ulcer in his mouth so is on pain killer and Septrin, but there is something more I cannot figure out, he really is not happy. Goodness I cannot lose another one!!!!!!!! I had a brilliant day at the SCC 75th Anniversary show at Wickham in Hampshire. Lizzy won best adult argente and Misty won best adult chinchilla with Maisie coming 2nd and Miracle 3rd. Misty then went on to win Best New & Emerging and had to go into a separate display pen for everyone to see!!! I am not sure how many new and emerging entries there were, but there were quite a few chinchillas, also some curlys and a lovely sable. Well done Misty her best result! Unfortunately there was no trophy!!!! Here is a photo taken by Lyndon. Poor Lemon Drop died yesterday, so very sad after everything I tried to do for her. RIP lovely girl and thanks for giving me some super babies!!!! 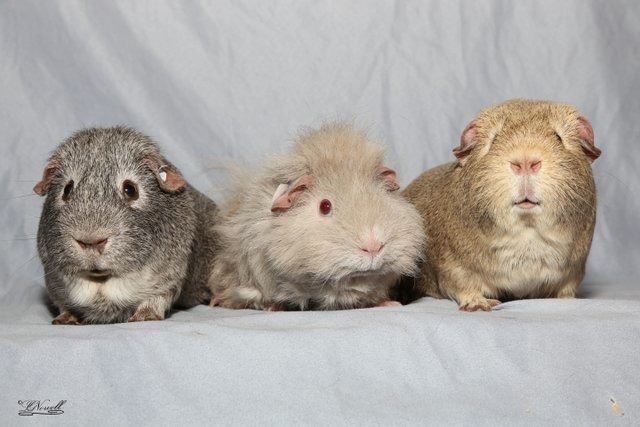 The baby boars have gone to live with Munchie and the little chin sow is living with Misty. Well my bad luck continues, Melody has got tox, cannot believe it, gutted!!!!!! On a better note, Lemon Drop's babies are growing well. Well Melody has died!!!!! 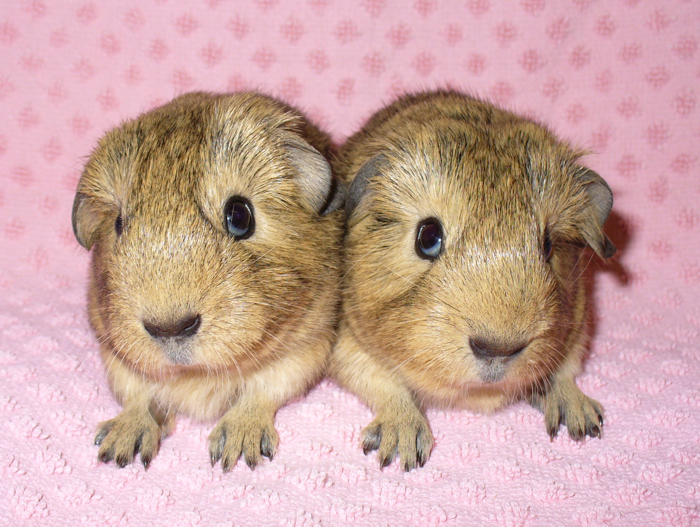 Cannot believe it, I think I am going to give up breeding guinea pigs!!!!!!! Well I must just be having a real run of bad luck. I lost Minty this morning such a shame, he just got so thin and passed away. Previously he had been drinking a huge amount of water, so probably he had a kidney problem, RIP lovely Minty, a super neutered boar who still loved the ladies!! Also not good news with Lemon Drop, she still has a eating problem, I have had her teeth checked twice by Tich and Chris, and they are now fine. Just don't know what to do with her, she just won't eat, very sad. I am syringe feeding her and the babies at the moment, the babies are thriving, but she is not!!! The cream baby sow I have left with Tich and Chris, she has a deformed lower jaw, she is touch and go, they are feeding her, if she makes it, she will stay and live with them. Lemon Drop had her babies this afternoon at last. I have been very concerned about her as she was so large and was not eating properly. She had 5 in total, 3 cream/beige chins and 2 self creams. 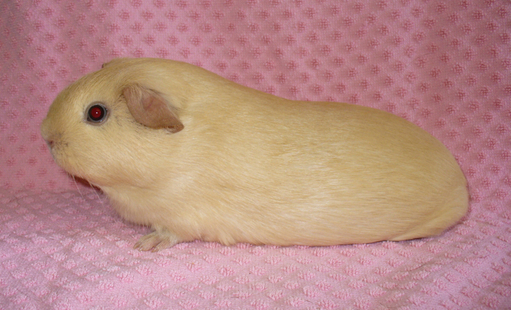 There is one sow just like Sherbert, so pleased, as Lemon Drop is Sherbert's sister!! Well I had a lovely day at Mid Sussex yesterday, but I can hardly bring myself to write this, I lost my beautiful girl Sherbert this morning, absolutely gutted!!!!!! RIP my lovely girl!! I had bathed her on Saturday ready for the show and she was fine, but she looked very unwell on Sunday morning, so I did not take her. I think it may have been her heart. Such a shame! I had a super day at Wyevern Cavy Club show yesterday, it was my first visit, and a very busy show! Maisie won Best New & Emerging with Sherbert coming 3rd. I came home with a super large trophy and a huge rosette. A very long day though, I think this is the furthest away show I have been too!! I managed to catch Poppy having her babies from Fudge this evening about 6.30pm. I just missed the first one which was dead, such a shame, I think it was a golden/lilac argente! 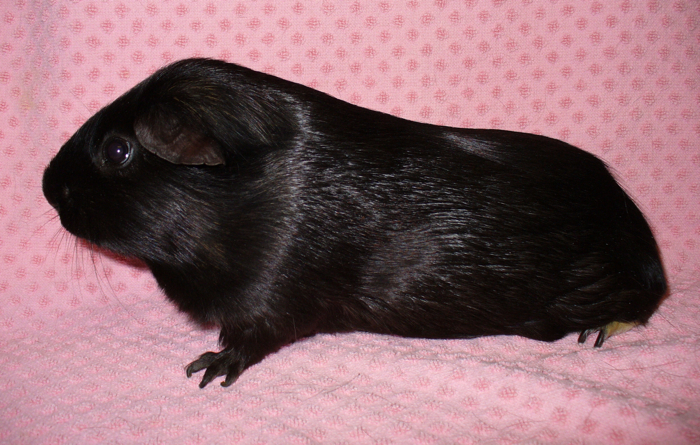 There are 3 dals, 2 of which are chinchillas and the other I think is a black otter dal, very cute. The other baby is a cream/grey chin with huge ears!! Will get some pics tomorrow. It was a lovely day at Parham, just the wind spoilt it really, as the tent was very noisy, and nearly blew away!!! I had some great results and came home with a big smile. Lizzy my argente sow won Best Marked & Ticked, Best Non Self and also RBIS!!!!!!! Also had Best New & Emerging with my chin sow Maisie and Miracle was seond, so a lovely day. Well done to all the winners. I will put the full results up on the Worthing & Eastergate website and get the photos from Lyndon. Here is a picture of the chin line up from Lyndon. Also a lovely picture of Maisie from Lyndon. I had a lovely day at the Kent show yesterday. Maisie won Best New & Emerging out of 11, brilliant result. 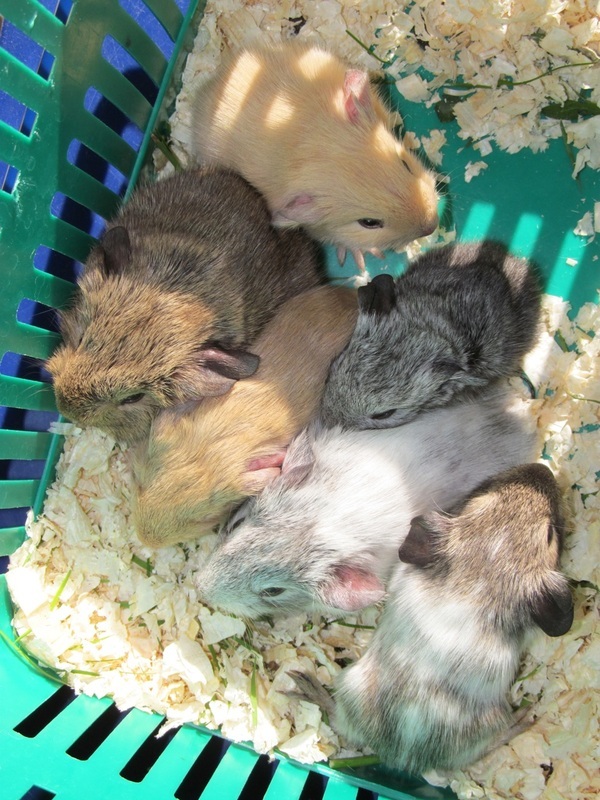 There were 10 chinchillas there in total, all the different colour! Lizzy had a good show as well she won Best Argente and went on to do well in the challenge classes. Well it will be good to get back to the shows, my first for some time will be Kent Cavy Club this Sunday, really looking forward to it. Apart from that, very quiet at Kingate Cavies, though I have been busy varnishing some new hutches, which are now finished, I am very pleased with them! 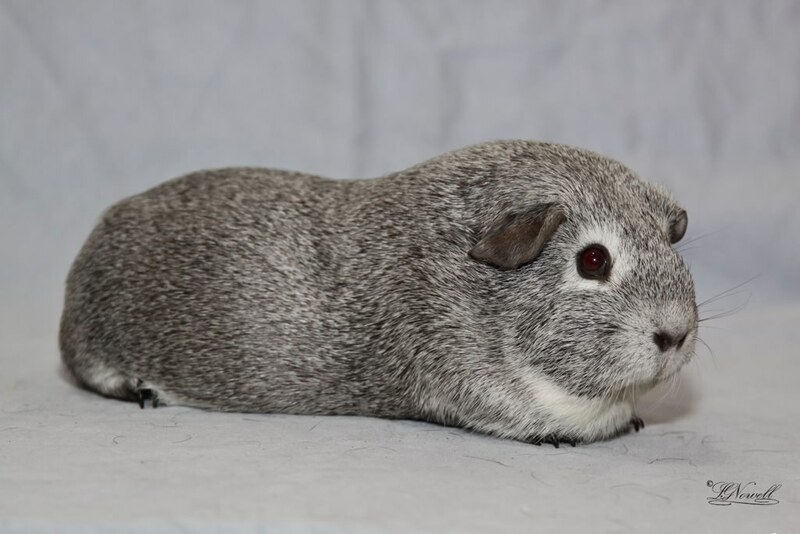 Pregnancies seem to be really slow here at the moment, but I think my little chin sow Poppy is definitely pregnant to Fudge, could be interesting, hoping for some dals of some type, not sure what I will get! I had a super day at the Kent Cavy Club show today. Maisie won Best New & Emerging and Sherbert came 3rd out of 6. Lizzy did very well and won Best Argente. I had a lovely day at the Canterbury & Coast show yesterday, very well run show, and super lunch. Maisie won Best New & Emerging and Sherbert came 2nd. Unfortunately Lizzy had a weepy eye and did not get judged, silly me for not noticing it in the morning!! Some lovely news tonight, just went out to the garage to the freezer, thought I would check on Saffy and she had just had 3 huge babies!! 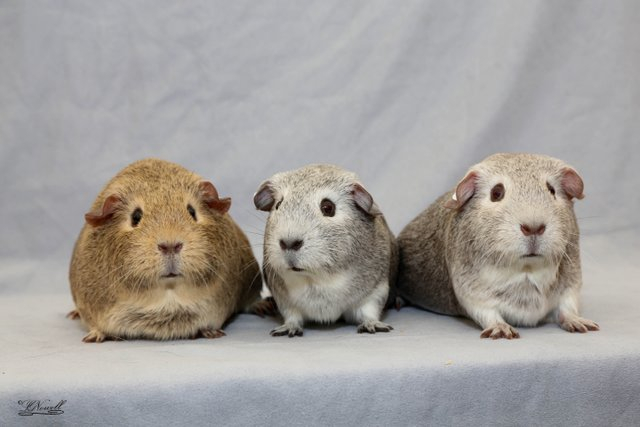 Two Saffrons and 1 cream/grey chin sow. All super babies, really big and moving around a lot already. She must have had them just before 10 pm. 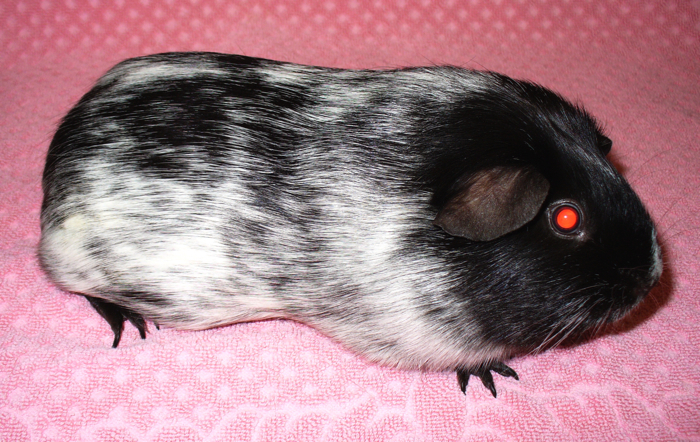 Merlin always produces lovely babies, and I really wanted a chin boar, I just don't seem to be able to get one!!!!!!! 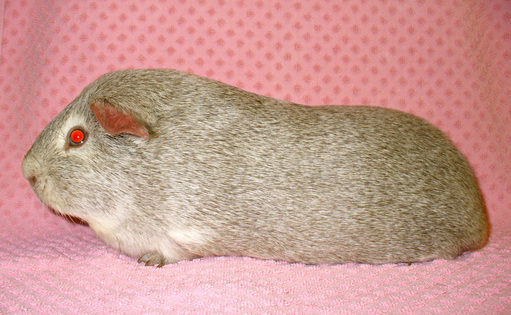 Not such good news today, the little chinchilla boar died, such a shame. He was fine when I checked them first thing this morning at about 8 am, but I found him dead later in the day. He did have a head tilt, maybe he was starved of some oxygen during birth and was not quite right. Though I will say that Katy is not being a good mum, she is really not interested in the babies and she could well have sat on him, he did seem squashed! She is not really letting the teddy baby sow feed either, so I have been helping out and holding her up so she can feed. I hope this baby will be ok!! Some good news today, Katy has had her babies this morning about 10.15 am. Unfortunately 1 DOA, but I have 1 cinnamon chin boar and 1 cinnamon chin teddy sow alive!!! Well done Katy! I am still waiting on Saffy though, I wouldn't be surprised if she has hers today as well! I had a super day at the Epsom Cavy Club show today. Lizzy won Best Argente and came home with a rosette and also Sherbert won Best New & Emerging out of 6 and also came home with a super rosette. Maisie came 2nd and Misty came 3rd. Lovely to see more chinchillas out today! Here is a pic of the chins, though they are not in the right order! Very sad news, I unfortunately found Tango dead this morning, a real shock. Such a shame, she was a super little sow that would live with anything else without any problems. I will miss her lots with her head always hanging out the hutch in the morning looking for food!! RIP sweet Tango! I have also been busy painting my new hutches, I have started with white on the insides and then I am going to finish off with varnish on the outside and one coat inside. I wish I had put white inside my other hutches, it does make them a lot lighter! I had a super day at the Fareham Cavy Club show in Wickham yesterday. Sherbert won Best & Emerging and Lizzy won best Adult Marked and Ticked. A lovely show and super day as always. Sad news this evening, I found lovely Jet dead in his hutch. Such a shame, just old age I think, he had been a bit quiet yesterday, and I had noticed he had got a bit thinner. 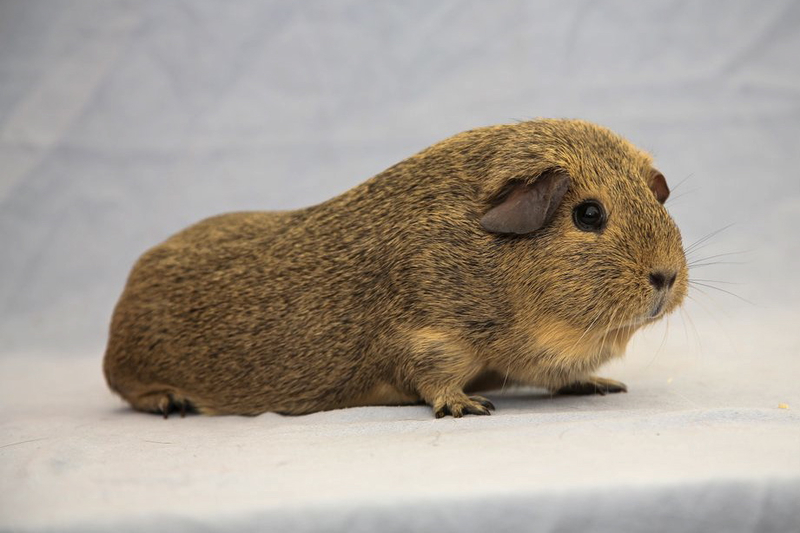 I think he was about 5, not sure as he was a rescue pig. RIP lovely Jet! I had a lovely day at the Essex show yesterday. Lizzy won Best Argente and came home with a trophy, and Sherbert won Best Chinchilla and also Best New & Emerging and came home with a lovely rosette and 2 trophies!!! Well done Sherbert. 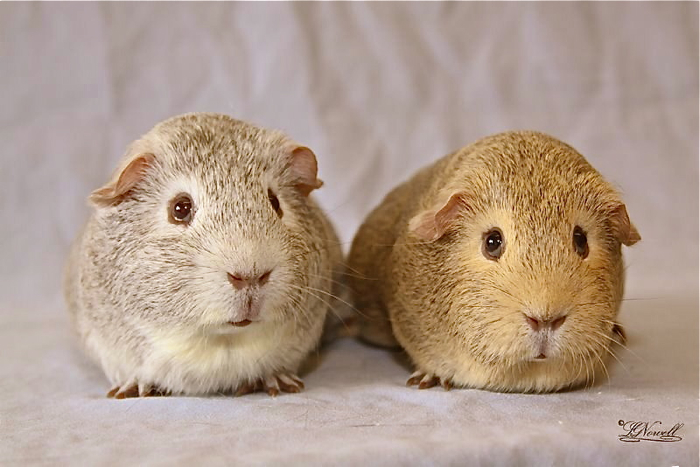 I am off to the Essex Cavy Society show tomorrow with my friend Jacqui, really looking forward to it as I have never been before. Gutted, I had to take Sugar to be PTS, so sad RIP my lovely Sugar, my best example of a silver chinchilla!! 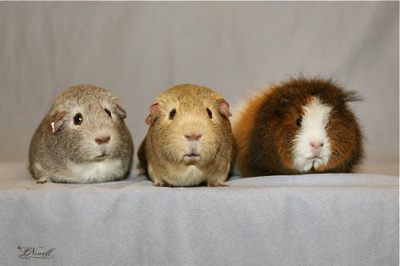 :( The way it is with guinea pigs, you have great days and very sad days!! I have had a super day at the Worthing and Eastergate show. Lizzy won 3rd BIS!!! Great result for her, she is a super sow, my 2nd best ever result!!! Also a surprise for the chins, Maisie won Best New & Emerging at her first show, beating her half sister Sherbert and also first time out Misty! Here is a photo of the chins together from Lyndon, Maisie is on the left. Here is a pic of Lizzy in the Best In Show line up. She is on the right. And a pic of Lizzy on her own. Not on a good note, Sugar definitely has tox, this is so sad, my lovely Sugar, I cannot leave her like this, I think I may have her PTS tomorrow!!!!!!!! When am I going to get some more chin babies??!! Sugar has got cystitis, I am very worried about her as she is off her food as well. I don't think I am ever going to get some more chin babies, this is not good news!! I have just been watching Lorna have 4 lovely babies this evening, 3 lilacs and 1 golden/lilac argente, all a good size. So pleased as these will be the last litter from Jack before he died!! 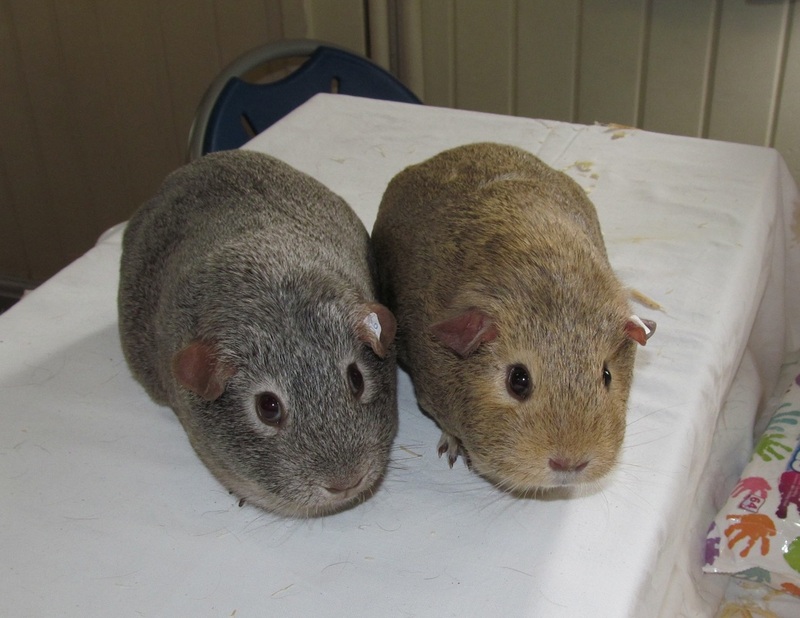 I had a lovely day at the Dorking Cavy Club show today, just took Jill and Sherbert and they both did very well. See Results page. 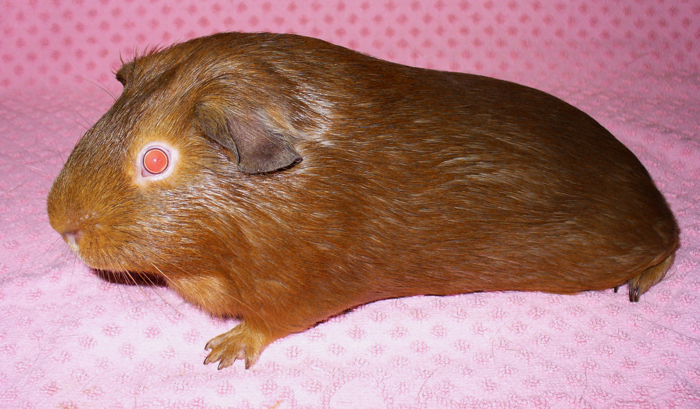 My Southern Cavy Club yearbook arrived in the post with the stars results for 2011. Well my pigs have done really well, with Merlin collecting the most and getting 45 stars for the year, the same as his dad Mozart did in 2010, so Merlin will be getting his own little plaque with his name on. Sherbert, Sugar and Mozart each collected 30 stars and Lizzy collected 15. Well done pigs!!! After checking my paired up sows yesterday, I think that Lorna may be pregnant to Jack! They were together before he died, so I really hope she is pregnant, that will be a lovely surprise. 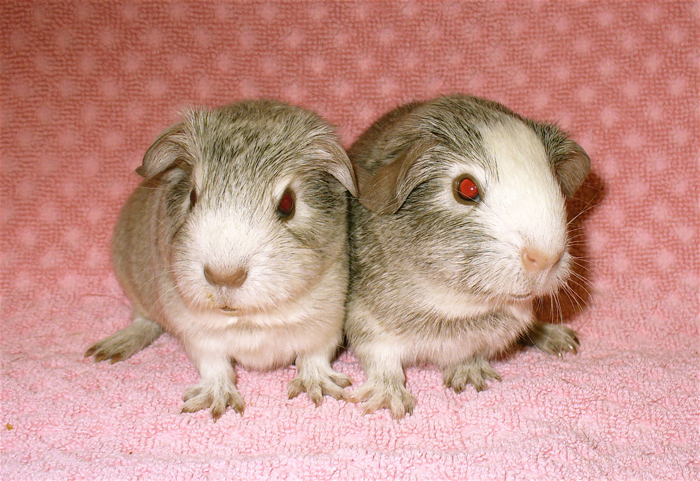 If not, Fudge is living with her now, so I may get some dals later on if Lorna is not already pregnant. At last my website is finished and I have changed my domain registration over from Webs to GoDaddy, which is more compatible with Weebly, so all seems to be working well!! I am having a go at making a new site, just in case my Webs one disappears after 28th January, hope you like it. Oh dear not a good start to the year, I found Jack dead this morning!! He seemed a bit quiet yesterday and had lost a bit of weight, but nothing much. RIP lovely Jack, you have been a super boar and produced me some lovely babies, especially lots of lovely sows, including being dad of my RBIS argente sow Lizzy!! Bit of a sad day today, found poor Mandy dead this morning, great shame. 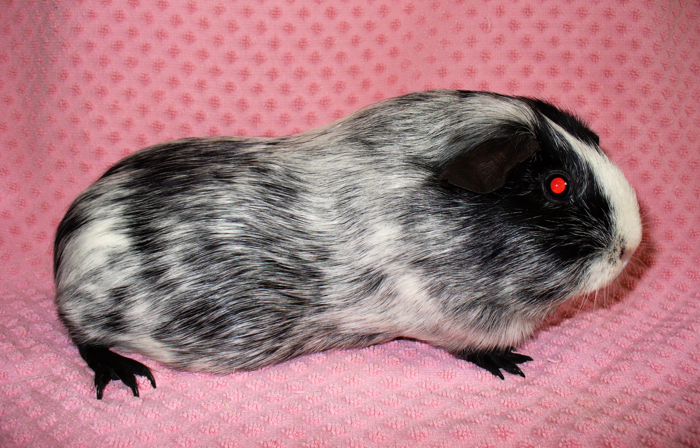 She gave me some super babies, one especially my lovely show boar Mozart, so her line continues in my chinchillas. RIP lovely Mandy. I had a lovely day at the Fareham Trophy show. 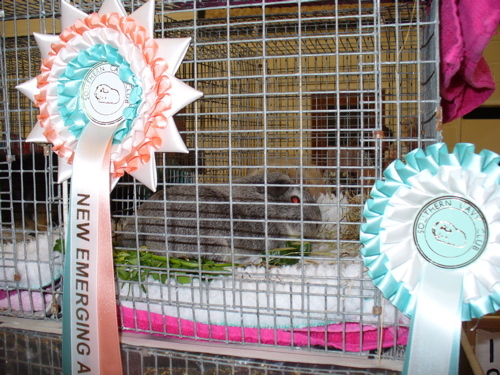 Sherbert won Best New & Emerging Variety, with Merlin 2nd and Miracle 3rd. Lizzy won Best Argente and also went on to do really well in the Best 5/8m Non Self Challenge, coming 3rd out of 56! Sherbert won a trophy, but unfortunately the best argente trophy was missing!! 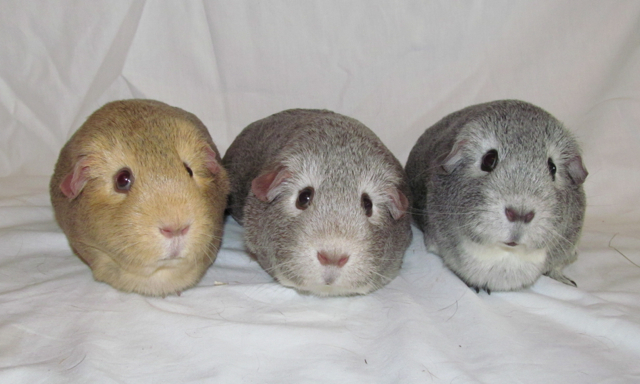 Here is a pic from Lyndon of my 3 chins, though they have put them in the wrong order, as Merlin was 2nd! Here is Sherbert with her prizes from Dorking and Fareham. Here also is Lizzy with her prizes from Dorking and Fareham. _Though a disaster when I got home, I found that Sugar had aborted her babies that were due on lst Jan, really don't understand why, a total shock! She seems fine though, so I hope she will be ok. What with losing Grace as well this week, not been my time for getting baby chins!! 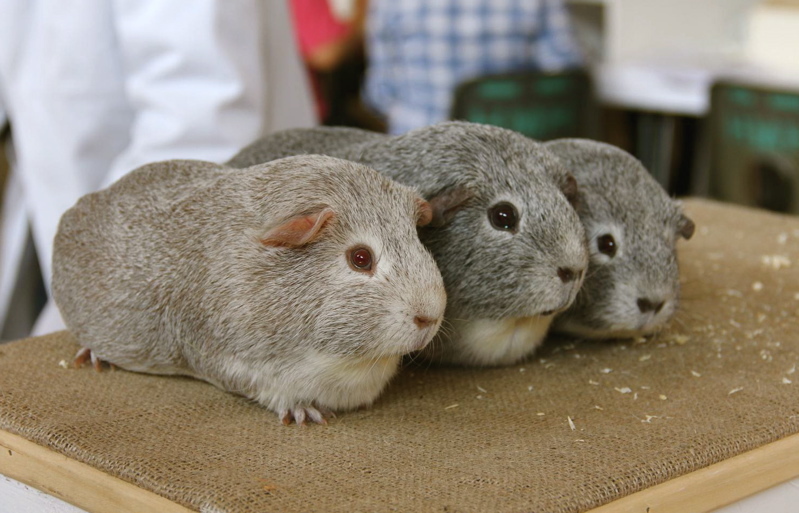 I had a lovely day at the Dorking Cavy Club show on Sunday. My 3 chins did very well, with Sherbert coming lst again, but this time Miracle was 2nd and Merlin 3rd in the Best New & Emerging Variety. Also my argente sow Lizzy had a great show, she won Best Argente and went on to come 2nd in the BIS 5/8m Grand Challenge out of 34!!! Well done Lizzy. I came home with 2 lovely shields to keep and some lovely rosettes. Here is a photo of Miracle and Merlin on the judging table. I had another super day at the Mid Sussex Cavy Club show yesterday. Sherbert won Best New & Emerging Variety, Merlin came 2nd and my new young boar Miracle came 3rd!! Also Lizzy did well and won Best Argente and came home with a rosette. A lovely show. 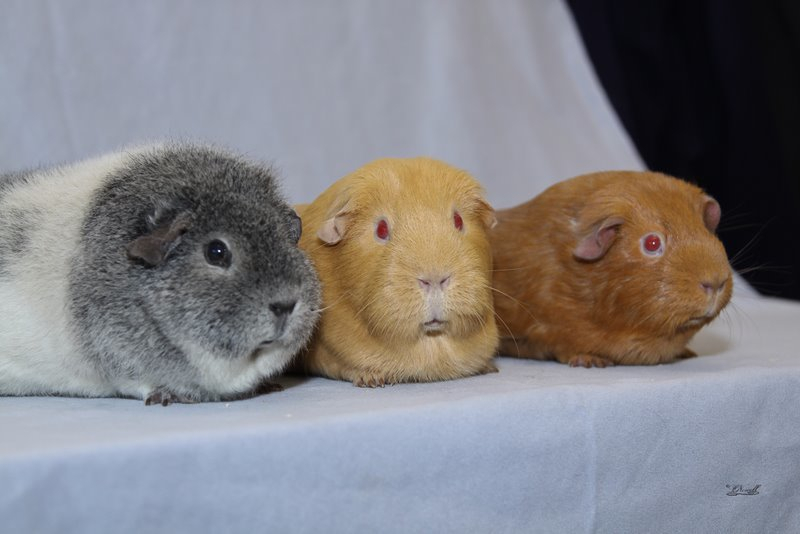 Here is a photo that Sharon took for my of my chins, lst Sherbert (middle), 2nd Merlin (right) and 3rd Miracle at his first show (left). 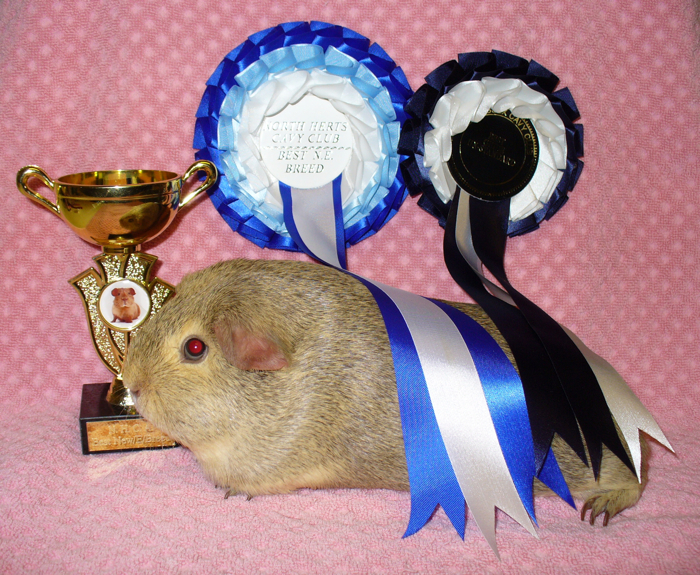 Here is Sherbert with recent trophy wins and rosettes. And here also is Lizzy with her recent wins. I had a lovely day at the North Herts Cavy Club show yesterday, Sherbert won Best New & Emerging Variety and Merlin came 2nd. Also Lizzy did well and came 2nd in the 5/8m Best Marked and Ticked. A lovely show as always. Here is a picture of Sherbert. Thanks for the photo Paula. Katy had her babies this afternoon, a few days early, so I was not expecting them. I went out in the garage about 3pm and found she had had them, but 2 were DOA. I must have just missed them being born, so sad, as one was still warm!!! She had 4 in total, and the 2 alive are both cinnamon chins I think, 1 boar and 1 sow. Came back from the shops this afternoon to find 3 really lovely baby sows in the hutch with Lorna, she had just had them around 4 pm. Two very lovely golden/lilac argentes and one self lilac with a really cute stripe of gold up her nose. Lorna seemed very attentive, so I hope she is going to be a good first time mum! I had a lovely day at the Epsom Cavy Club show on Sunday. Sherbert won Best New & Emerging Variety and beat her dad Merlin, and my argente sow Lizzy won her class and went on to win the Marked & Ticked Challenge. 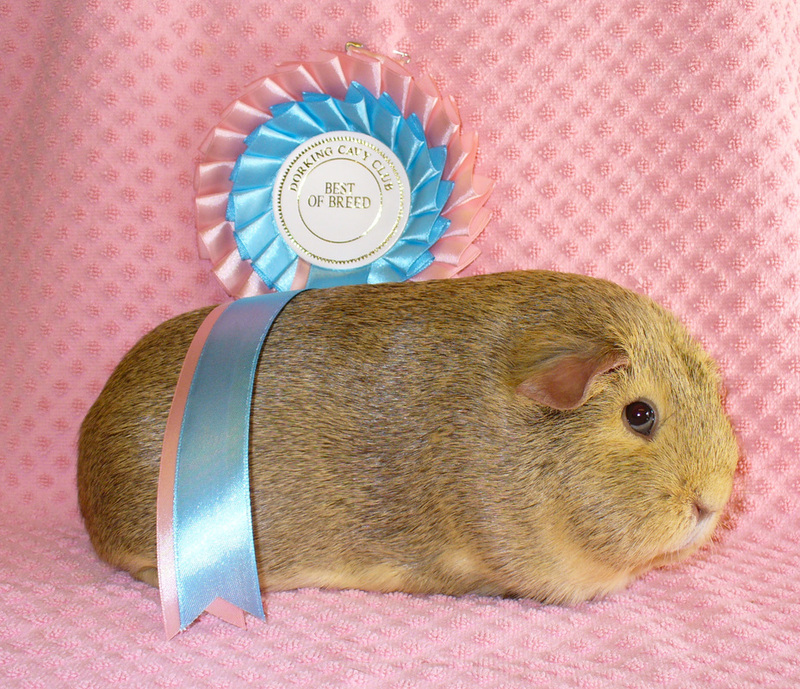 Also my dal pet Fudge had his best ever result, he was in the final line up for Best Pet. 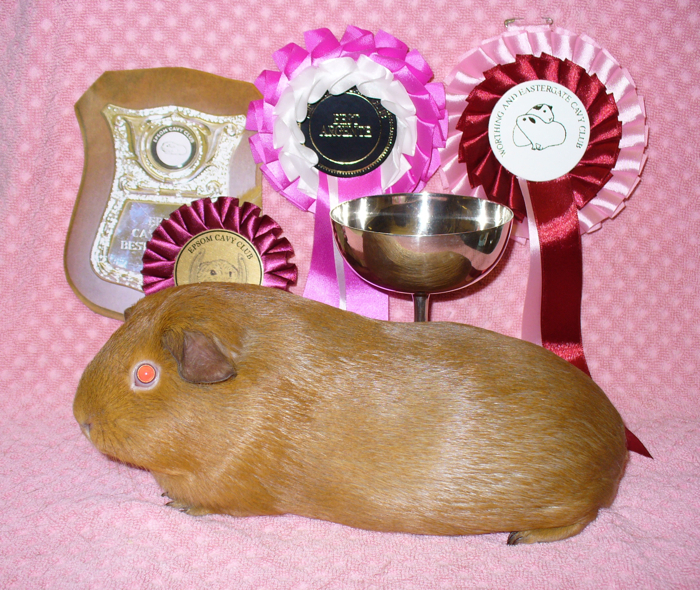 He did not get placed but was in the last 7 out of 77 pets entered, well done Fudge. Here is a picture of Sherbet and Merlin on the judging table. 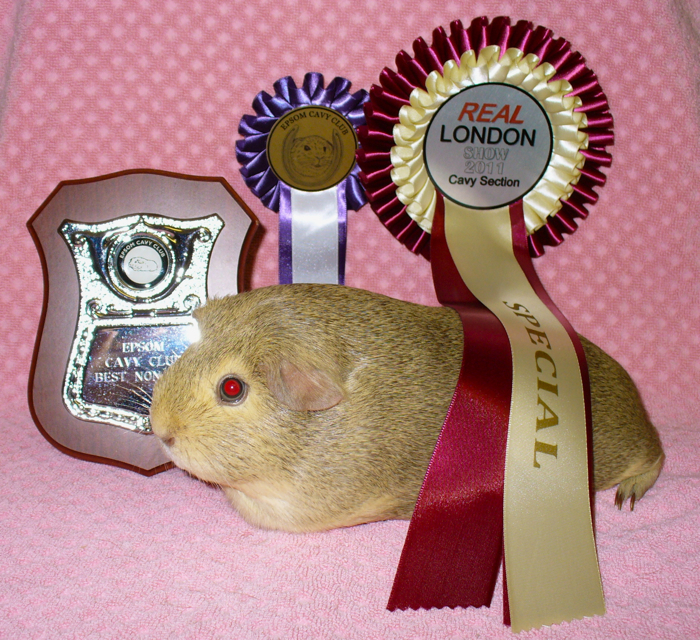 Here is a picture of Sherbert with her Epsom trophy and also her rosette from the Real London Show. I had a lovely day at the Kent Cavy Club show yesterday. I had lst and 2nd Best New & Emerging Variety with chins Merlin and Sherbert and came home with more lovely rosettes and a trophy, for Merlin. 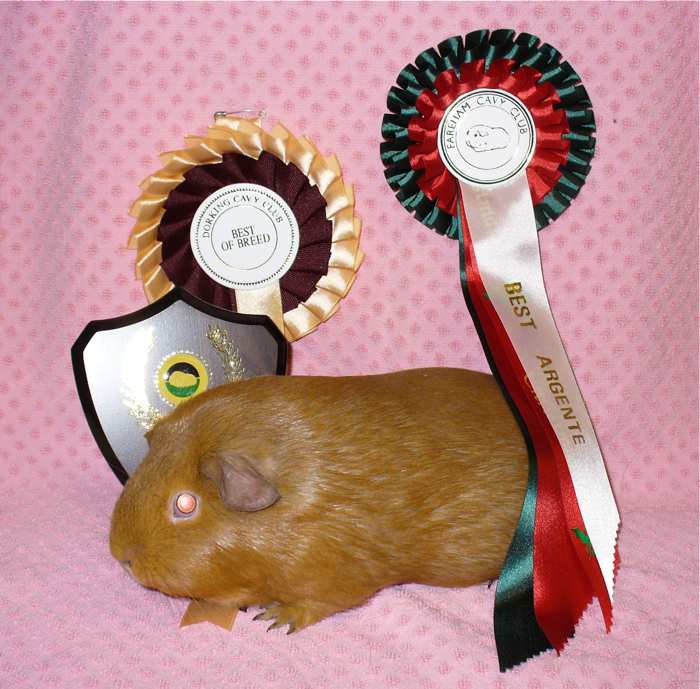 My argente sow Lizzy won her breed class and my dal pet Fudge won his first rosette and won the best u/5m smooth adult ex pet. So a super day. Here is a picture of Fudge. Here also is a picture of Merlin with his trophies from Worthing and from Kent. I had a great day at the Worthing & Eastergate show yesterday. I got lst and 2nd Best New & Emerging Variety with chins Merlin and Sherbert and came home with some lovely rosettes and a trophy. My argente sow Lizzy did well and won best argente and did well in the marked & ticked challenge behind Jo's lovely choc dal. Here is a photo of Merlin and Sherbert from Lyndon. _Also my de cream sow Lemon Drop won best cream and also came home with a trophy, so a very good day!! Here she is with her trophies. I have just seen Glitter have the most gorgeous litter of 5 chinchillas at lunchtime today. All are lovely and chunky and super colours. 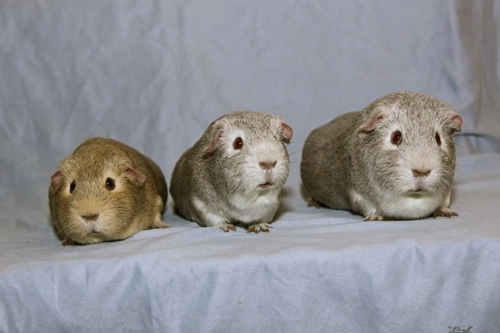 Four sows and 1 boar, and one of the sows in a cinnamon chinchilla the others are silvers. Mozart really does produce the most stunning babies. This will be Glitter's final litter, she is a really super mum. I had a brilliant day at the Real London show, Merlin won Best New & Emerging Variety and Sherbert his daughter came 2nd. Came home with a super large rosette and a lovely trophy. And keeping it in the family, Merlin's brother Dan that I sold to Heather came 3rd!!! 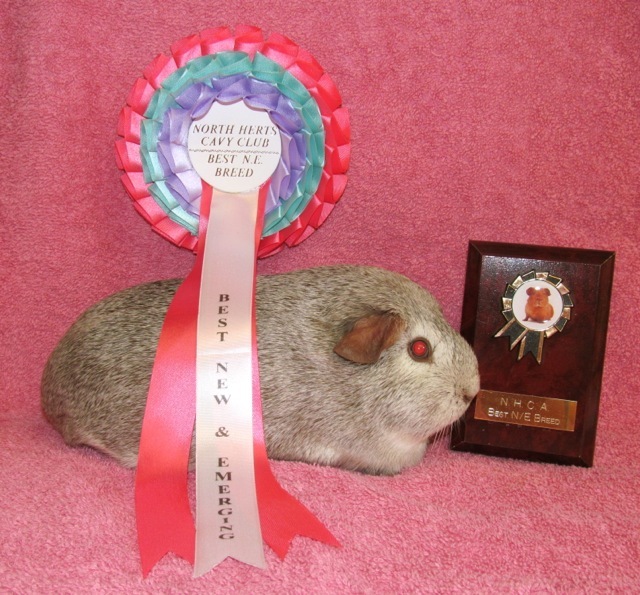 Here is a photo of Merlin with his rosette and trophy. 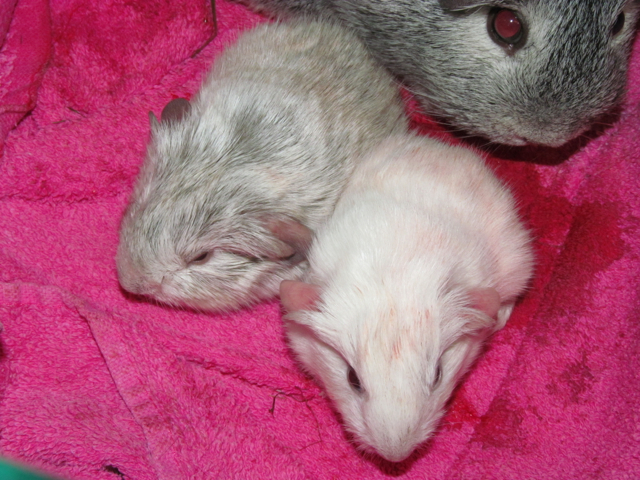 Saffy has had 2 really chunky babies this morning about 11am while I was in the garage cleaning out. I think they are both sows and a good size!!! 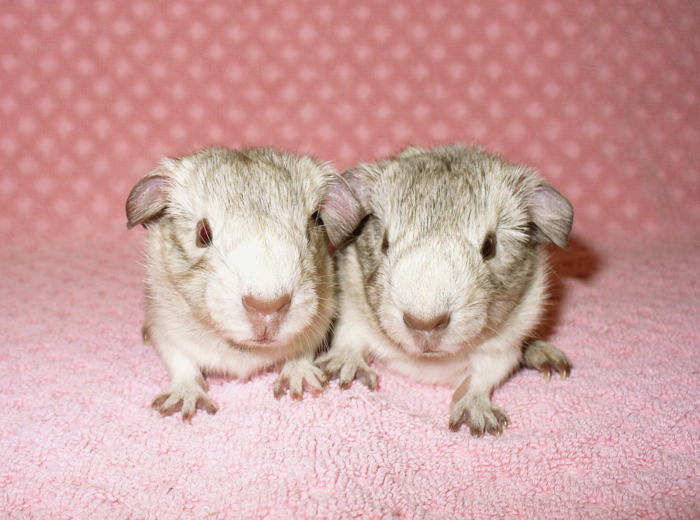 They look like cream/grey chinchillas. Merlin is the dad, so they will carry white. I just love chunky babies!!! A very sad today, unfortunately I have lost my lovely dalmatian sow Minstrel, I found her dead in the hutch this morning. This is a big surprise, she had been fine, I had not seen anything obviously different about her, all I can think of it was just old age, she was my oldest pig, getting on for nearly 6. I will miss her lots, RIP lovely Minstrel!! I had a lovely day at the Dorking show yesterday. 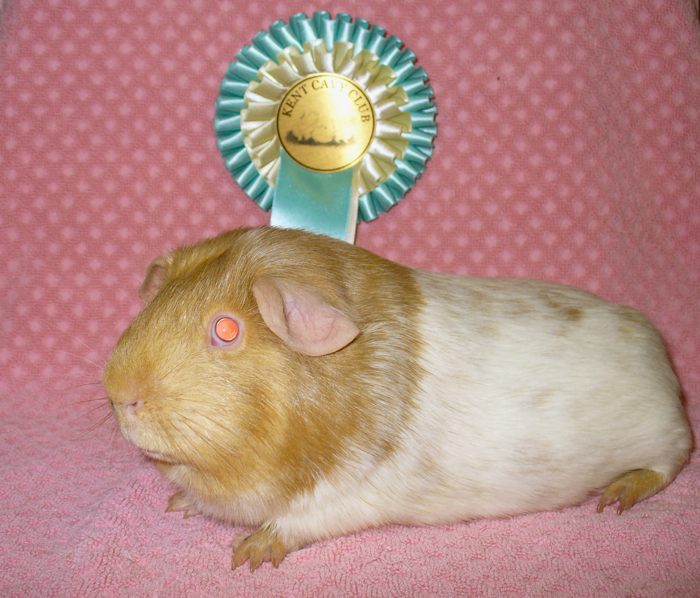 I won Best Argente with Lizzy, with Ricky coming second, so she came home with a lovely rosette. Also a surprise with the chins, lovely little Sherbert one Best New & Emerging, beating Sugar into 2nd and Merlin 3rd. 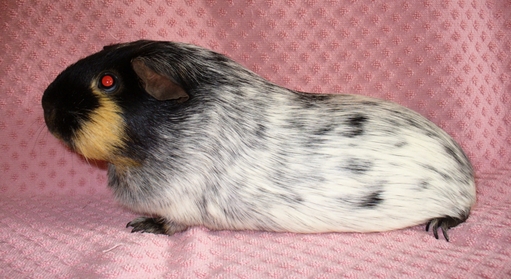 So very pleased, her best result so far, she is a very pretty little pig. Not a good morning today, I found poor Melody looking very sorry for herself with 4 dead babies in the hutch and 2 just alive, but very cold. Poor Melody, she had not been looking very happy for a couple of days, I think due to the heat. I am not surprised with 6 babies inside her!!! I think I was lucky not to lose her to the dreaded tox! Anyway the babies are both chins, and I think both boars, but tiny as they were born early, they were not due till 9th August. Update on the baby boars from Melody, after a very shakey start, they started feeding from her and are growing rapidly into really cute baby boars. So pleased as I thought I was going to lose them. I had another lovely day at the SCC stock show in Fareham. Sugar won Best New & Emerging Variety this time with Merlin 2nd out of 16, so a big class. Also my little self cream sow Lemon Drop won best u/5m cream and came home with a lovely rose bowl trophy. Very surprised with this as it was her first show. Nothing special for the argentes, but this time Ricky beat Lizzy in the u/5 argente class. Here is a picture of Sugar in her pen. _Also a picture that Lyndon took, for the SCC website. 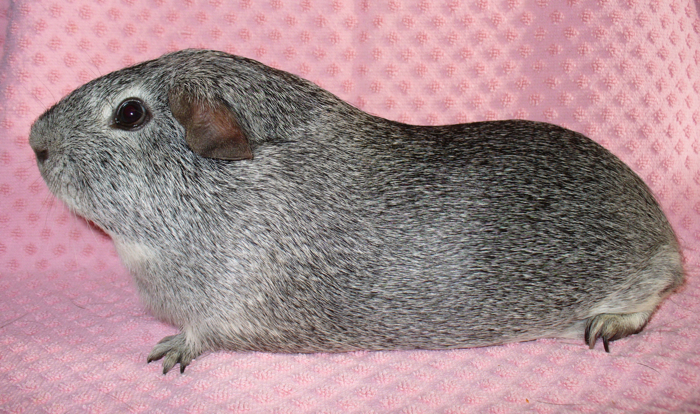 I love this photo of her, she looks like my perfect example of a good silver chinchilla!!! I had a brilliant day at the Kent Coast show today, my best ever result. My little golden/lilac argente sow Lizzy won Reserve BIS out of 95 pigs, I am amazed!!! Also Merlin won Best New & Emerging Variety, so very pleased with him also. A great show!! 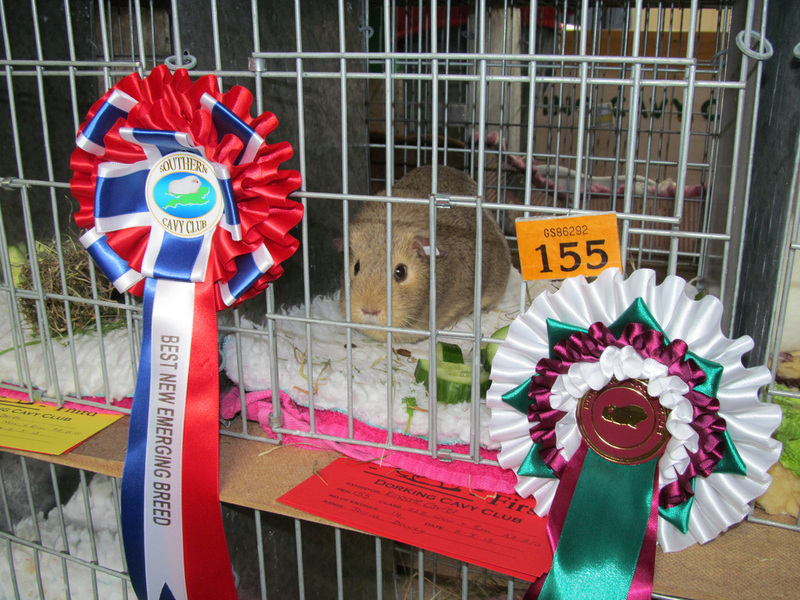 Here is a picture of Lizzy (one the right) with the best agouti and best dutch when she won best Marked and Ticked. (Thanks Lyndon for the photo). _Also a photo with all her prizes! I have had another lovely day showing at the Mid Sussex Cavy Club show this time. Mozart won Best New & Emerging Variety and Merlin came 2nd out of 8. Well done boys! Also I took a couple of golden/lilac argentes along for the first time, Ricky and his sister Lizzy. Ricky won Best Argente and came home with a lovely rosette and also won the Any Other Variety Non Self u/5 months challenge. Well done Ricky for his first show! What a brilliant day I have had at the North Herts Cavy Club show in Sandon today. Sugar won Best New & Emerging Variety and beat the boys this time and Munchie won Best Super Pet in show!!!! My best pet result in years and the best result Munchie has had so far. Well done Sugar and Munchie. They both came home with lovely rosettes and a trophy each. 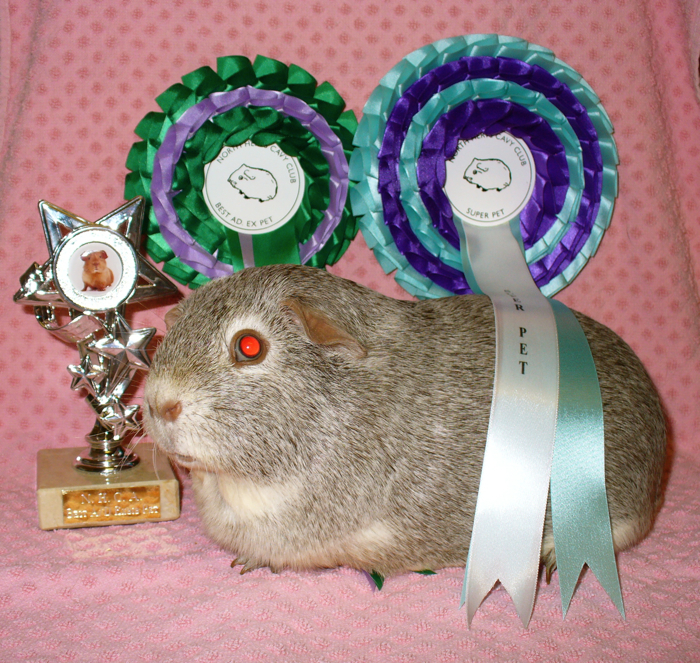 Here is Munchie with his rosettes and trophy. Not great news today, Tess had her babies in the afternoon, I found her just has she was trying to give birth to a very, very big baby. It was a bit stuck, so I helped her with it, but it was unfortunately dead. Such a shame as it was enormous, I think the biggest baby I have every seen, it weighed 222g!!! It was a pink eyed white sow. Anyway, she has one other white sow alive, but she is not looking very happy, as you can imagine, I hope Tess will be ok, she looks a little shell shocked and I am sure will be a quite bruised!! I have given her lots of fluid and some Osteocare and pain relief, which think will help her. I had a lovely day at the Worthing & Eastergate show at Parham Park yesterday, even if the rain and mud was awful!!! Merlin won Best New & Emerging and Mozart came 2nd out of 11, so well done boys a brilliant result. Here are a couple of pictures from Lyndon. 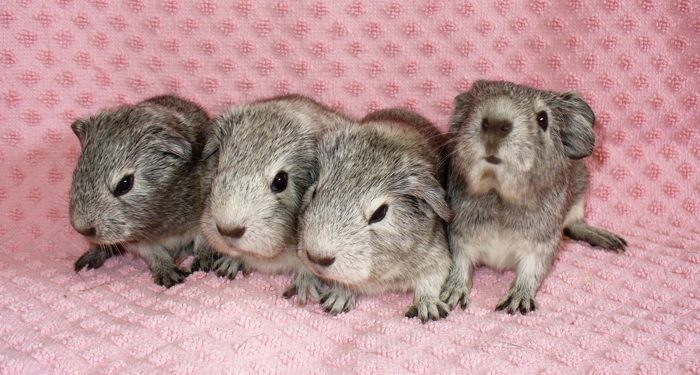 I had a lovely surprise this afternoon, I found 4 very cute little chin babies looking at me in the hutch. I checked Silver at about 1.30 pm and found them in there. 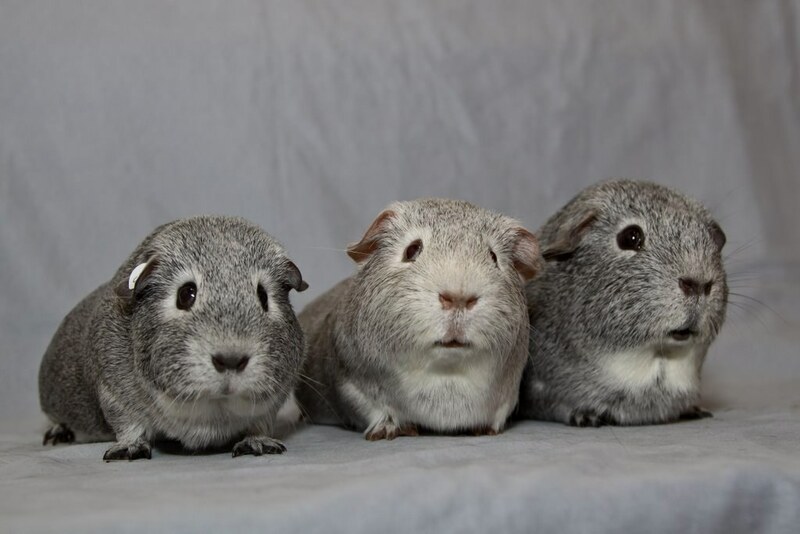 All silver chins and they all look quite large. I had a great day at the Kent Cavy Club show yesterday. Merlin won Best New & Emerging, Mozart came 2nd and Sugar came 3rd. 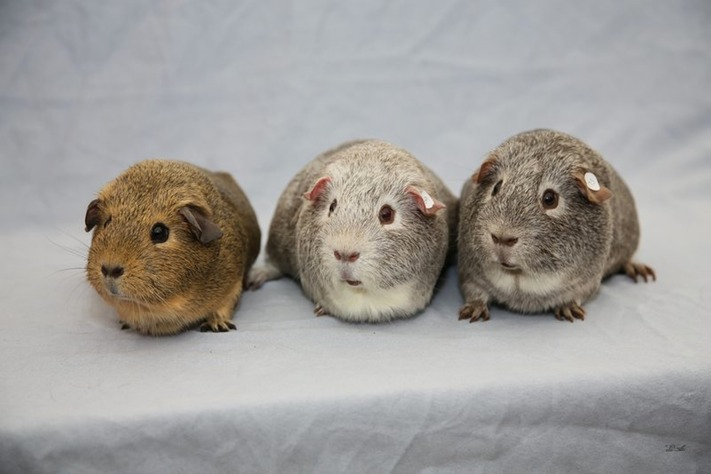 On the Southern Cavy Club show side, Sugar came 1st, Merlin came 2nd and Mozart came 3rd, so a brilliant result for all 3 of them at the double show. Munchie did well in the pets and also came home with a rosette, so a very good show. Here is a photo of the 3 chins. Saffy has had her babies early this morning, unfortunately 1 DOA dal boar real shame but she has had 2 huge golden/lilac argente dalmatian boars, and I think one is the biggest baby I have ever had. He weighs in at 150g!!! Both really cute and a lovely colour. Well done Saffy! Another lovely show today, this time at Dorking Cavy Club. Mozart won Best New & Emerging this time, Sugar was 2nd and Merlin came 3rd. I also took some different pets today. Pickle won her smooth pet sow class and Munchie won his smooth pet boar class. Puff had a brilliant show and went through to the final 6 on the table for Best Pet in Show out of 50, but did not get a place, but a great result for her, well done Puff. 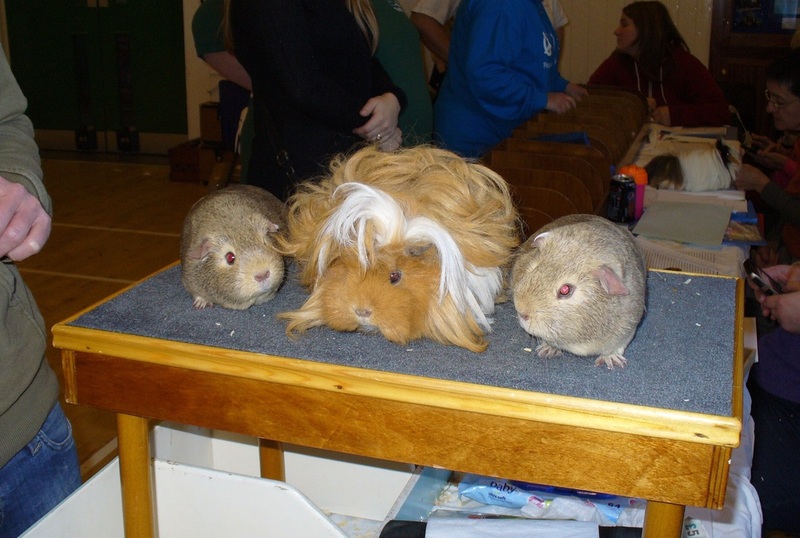 Here is a picture of Puff in the final line up for the pets on the judges table, she is the big fat teddy in the middle!! I have had another lovely day at Sandon, North Herts Cavy Club show today. Great result too, Sugar won Best New & Emerging Variety again, Merlin came 2nd and Mozart came 3rd, so a clean sweep with my chins. Munchie also did very well in the pets and won 7th Best Pet in Show. I think his best result. Here is a picture of Merlin and Sugar on the judging table. Honey had her babies in the night. I went out to check her at 12.30 am, and she had just had 3, and then she had 2 more while I was watching. Really surprised though, only 1 chinchilla and 4 self creams!! 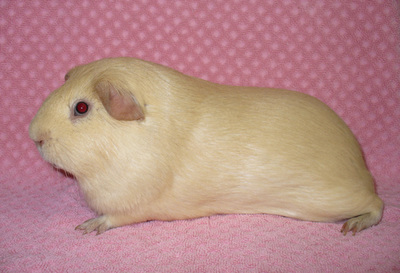 The chin is very cute though and is a cream/beige chin, which is what I had been trying to get. They all seem fine, and have been feeding today, lovely cute chunky babies. I have had a lovely day at the Epsom show today and a super result again. Sugar won Best New & Emerging Variety again out of 6, brilliant result. Only her second show and her second win!!! Merlin came third. Here is Sugar. Sparkle has had her babies in the night, I found them this morning, a litter of 5 all golden/lilac argentes like Jack. All seem fine, but one is very, very small. Well I had a brilliant day at the Fareham Cavy Club show yesterday. 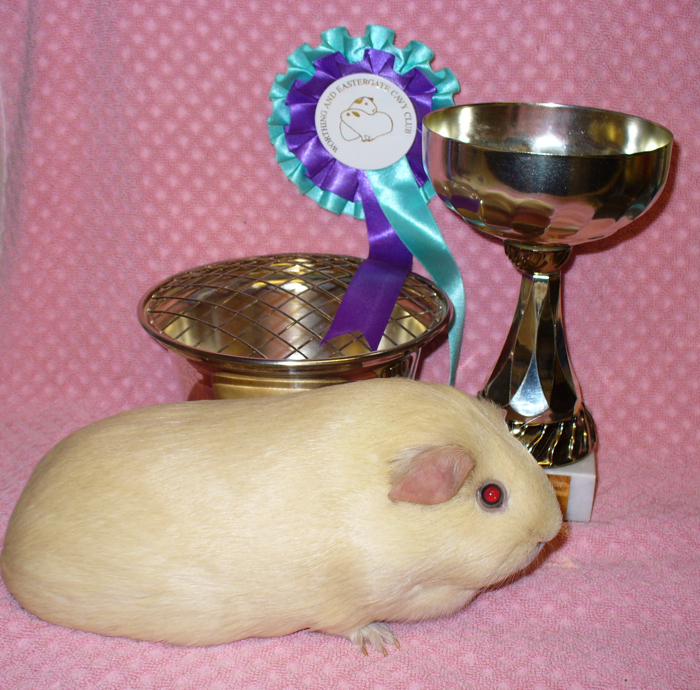 Milly did well and won Best Adult smooth pet sow, and my little chin sow Sugar won Best New Variety out of 14 at her first show!!! She beat both Merlin and Mozart who also did very well and came 2nd and 3rd Best New Variety so they all came home with a rosette. A lovely show, but very busy. Here is a picture of the 3 of them taken by Lyndon. Goodness me, more bad luck for me today, I found Molly with 5 dead babies this morning, all still in their sacks. Cannot believe it, she had them in the night and just left them, such a shame. 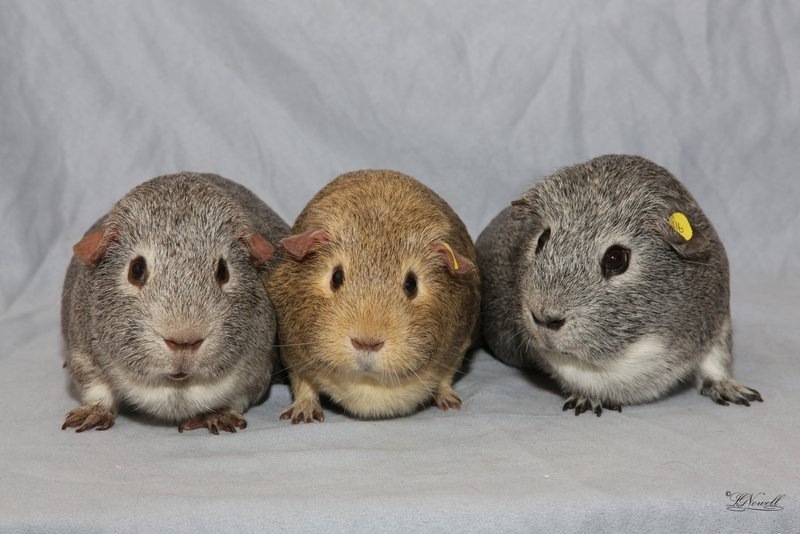 Three were dals and 2 were agoutis (I think). Glitter has had a litter of 6 this morning!!! 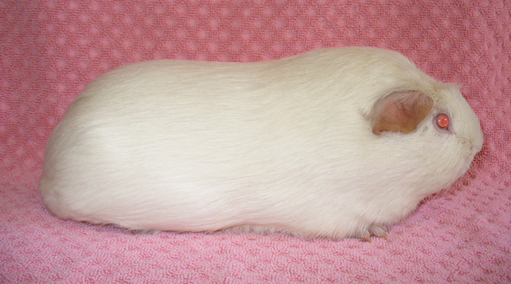 3 chins, 1 white/lilac argente, 1 de white and a small pe white. They all seem fine. It was lovely to find them all clean and dry in the hutch, as I have been waiting for ages, I thought she would never have them!!! I have had a brilliant day at the Worthing & Eastergate show, I had 1st and 2nd Best New & Emerging out of 11 with Mozart and his son Merlin, so a brilliant result for both of them. Well done boys. Here is a photo taken by Lyndon of the pair.